Guide in 'Crafting & Gathering' published by Caimie Tsukino, Sep 24, 2017. 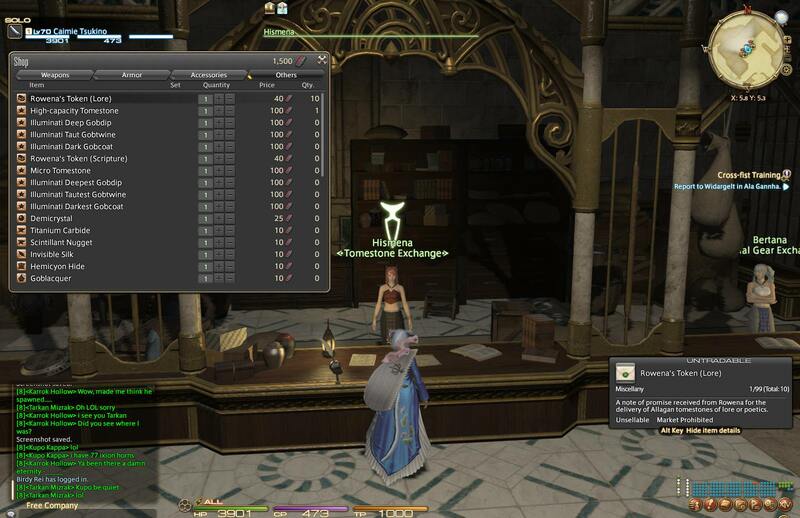 This guide is a continuation of the original FF14 crafting guide series by Caimie Tsukino. 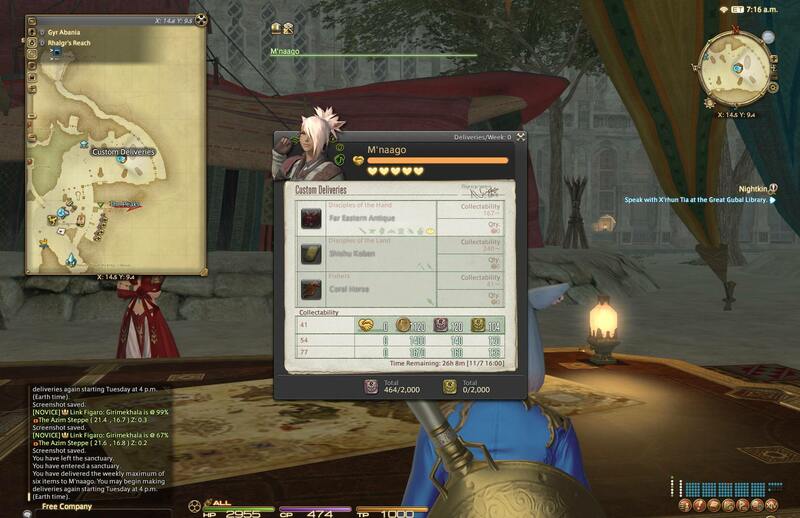 The biggest change in crafting in Stormblood is the addition of new "Basic Crafting Skills" (skills that are automatically acquired by any crafting class as long as they reach the required levels). Previously, in A Realm Reborn (ARR) and Heavensward (HW), certain cross class skills are considered "essential". Crafters must acquire them if they were to do end-game crafting. Now, with the addition of the new Basic Crafting Skills, new Specialist Skills and the revamping of certain existing skills, single-class crafters become viable. I'm not saying they will be as strong as omni-crafters. People with multiple level 50 cross class skills will still have a bigger edge. But at least if you really insist, you can still play end-game crafting with a single level 70 DoH (Disciple of the Hand) class. Please be aware that, despite many cross class skills now having a basic crafting skill version that can be obtained between level 60 and 70, there are still many cross class skills without a "replacement" (I put "replacement" in quotations because they aren't exactly completely replaced. Most of the new skills just offered stronger, CP-consuming "alternatives"). For instance, Muscle Memory (CUL 54), Piece by Piece (ARM 50) and Ingenuity II (BSM 50)... these cross class skills that are important for progress received no "replacements" in Stormblood. So having them in your arsenal is still a great advantage. Important CP-recovery skills such as Trick of the Trade (ALC 15) and Comfort Zone (ALC 50) also received no "replacements", and so they are still as useful as they have always been. In fact, even though Byregot's Brow (level 51) has been buffed to become a viable "alternative" for Byregot's Blessing (CRP 50), Blessing is still far more superior when IQ stack is as high as 9 to 11. Thus, comparing with the new Stormblood skills, many old cross class skills are still the choices of actions if you have them in your arsenal. Most of the "replacements" (or more like "alternatives") skills provide stronger power than their cross class counterpart, but requires extra CP to be invested. One thing in Stormblood is that our CP pool has been greatly increased to compensate this issue. Thus, we can comfortably use the new "replacements". But just keep in mind that the cross class, CP-free versions of these skills may still play a role when more difficult recipes arrive in later patches. In summary, if you're a brand new crafter who's just getting started, I'll still recommend you getting at least an ALL-15 status -- level up all your DoH to level 15 to acquire all level 15 cross class skills. This is a pretty easy thing to do, but its impact is gigantic. After that, if you are only interested in a single crafting class, that's ok. With Storm Blood's changes, you may select that one class to be a specialist class, and level up only that one class all the way to lvl 70. However, do not expect the leveling of that one class to be easy. 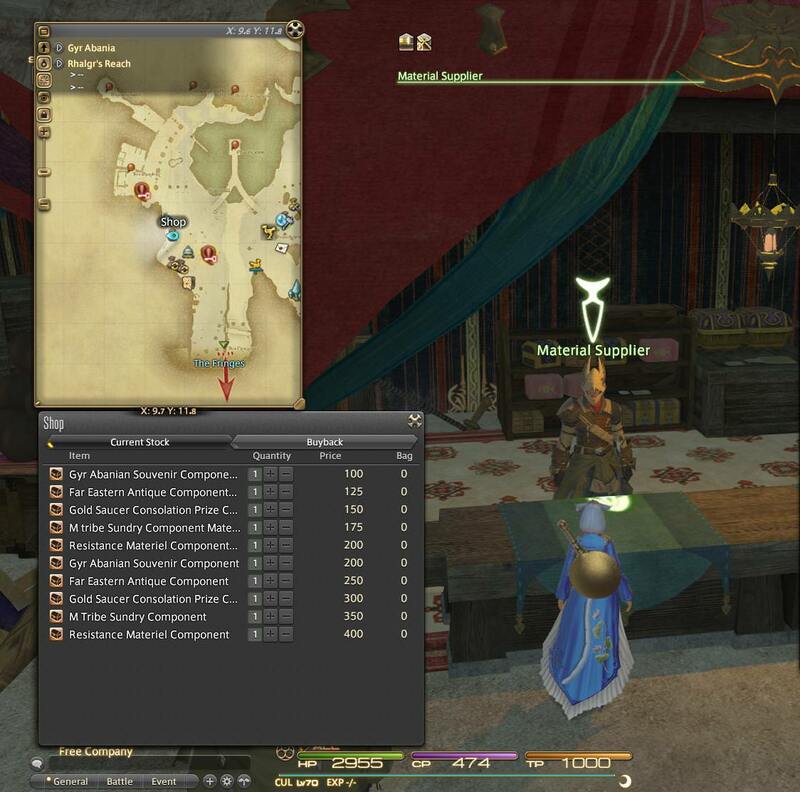 Just like in ARR and HW, classes are inter-dependent on each other's crafted mats. Thus, you will be forced to buy a lot of things from the marketboard (MB). If you're a crafter who already has multiple classes close to level 50, or if you intend to go deep into crafting anyway, I suggest you push multiple classes to at least level 50 (and CUL to 54 for Muscle Memory, and GSM to 54 for Maker's Mark too), and get those important level 50 cross class skills, as they will definitely be beneficial down the road. Despite the 10% higher fidelity than Hasty Touch, it's not exactly a true replacement of Hasty Touch... Under Steady Hand II, it's only at 90% success rate. But in this game, as long as it's not 100%, then you will eventually see a string of failed touches one day, even at 90%. It's just what the RNG is like. Also, although 5 CP may not sound like a lot, when you try to reach IQ9 or IQ10 in a rotation, you'll still need 8 to 9 touches, which means it's an extra 40 to 45 CP investment comparing with Hasty Touch. Sometimes, we could have put that CP into something else more important in our rotation. I'm not saying Hasty Touch II isn't better. It is better than Hasty Touch due to the slightly higher fidelity. But it does come with a cost. It's strong. It's good. This is a very powerful and versatile skill for progress, and can almost replace Careful Syn II except that it costs 7 CP. It does completely replaces Standard Synthesis, since CS III has the same power as Standard Syn of 150% efficiency, but Standard Syn cost 15 CP and has only a 90% success rate. Thus, once you acquired this skill, you can remove the Standard Syn button from your hotbar forever. It is superior to its ARM level 15 counterpart, Rapid Syn, on the sense that it provides slightly more progress and has a slightly better success rate. It does, however, cost 12 CP, whereas Rapid Syn cost nothing. So if you use it more than once in a rotation, it does burn off your CP pretty fast. Increases Inner Quiet stack by one (up to 11) when successful, halves stack upon failure. Don't let the tool tip fool you! It says "increases IQ stack by 1". But it actually means "additionally by 1". This is an additional IQ stack on top of the normal IQ stack you gain per touch. Thus, Patient Touch adds a total of 2 IQ stacks per successful touch. For a measly 6 CP cost and at 80% success rate when paired with Steady Hand II (same as a Hasty Touch, but costing 6 CP), it allows you to add 2 IQ stacks per touch... that's ridiculously powerful. But of course, it comes with a price - if any Patient Touch fails, you will lose half your IQ stack, i.e. if you try to use Patient Touch at IQ7 and you failed, you will lose 10 durab, and your IQ will drop to IQ4. Because of this, Patient Touch is NEVER used when your IQ is more than 4 or 5. In fact, I personally ONLY use it when IQ is 1. Because at IQ1, you got nothing to lose. If it fails, you're still at IQ1 anyway. If you were planning to use Hasty Touch on your first touch, then there's no reason not to replace it with a Patient Touch. If you really need the power and wanna gamble with it, you can use it on your first two touches, in the hope that if both touch land fine, you'll reach IQ5 right away at only a cost of 12 CP. Just be prepared to take the consequences when it fails. Because of the nature that Patient Touch is normally used on your first touch (unless you need 100% fidelity, and chose to use Basic, Precise or Prudent Touch), it seems the name "Impatient Touch" would have fitted it better! LOL! Anyway, long story short, in conclusion, Patient Touch is the perfect replacement for your first Hasty Touch when your IQ stack is at 1. Restores 5 points of durability after each step for the next 8 steps. Each step overwrites all other durability-restoring actions. NOTE: This skill is locked behind level 65 class quest. You have to complete the level 65 class quest for a particular class in order for that class to use this skill. In other words, you need to complete level 65 class quest for every class in order for every class to own this. This is an extremely important skill to acquire... 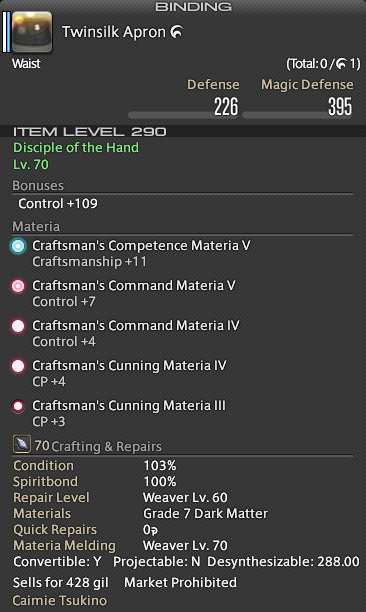 In Stormblood, the most important, strongest, new crafting skills are arguably Manip2 and Prudent Touch (see below). The two skills form an incredible combo that can be used to tackle even the most difficult recipes in Stormblood. Interestingly, although Manip2 is supposed to be an improved version of Manipulation (Manip), it is more than just an upgraded Manip. Manip2 is also kind of a replacement for Waste Not (WN) (56 CP) and Waste Not II (WN2) (98 CP) as well. WN2 is well-known for being the most CP-efficient skill for adding 4 more steps (assuming at least 7 steps are being utilized to consume durab). However, it is also infamous for being inflexible, since you cannot take multiple Trick of Trades in the middle of it (please see Caimie's Crafting Guide (part 1) Ch10 for details), and I personally dislike it in manual crafting. In contrast, the old Manip is very flexible, but is a skill that is mostly used for 40 or 35 durab items only. We rarely use Manip for 80 or 70 durab items due to it not being as CP-efficient as WN, WN2 or Master's Mend II. Manip2 has the advantages of WN2 of being super CP-efficient (even more CP efficient than WN2), yet it has the flexibility of Manip (allows multiple non-durab consuming steps to be performed in the middle of it, as long as durab is not maxed). Once you have acquired this skill and Prudent Touch, Manip2 pretty much replaced WN, WN2 and Manip, and can be used in 80 durab items as well as 40 durab items. As mentioned above, this is another must-have in Storm Blood. Together with Manip2, it forms an incredible combo that can be used to tackle both 80 and 40 durab items. As you can see, the one that utilizes PrudT and Manip2 is easy, straight forward, secure, flexible and CP-saving. Whereas the other rotation that utilizes Hasty Touch and Master's Mend II is complex, inflexible (had use a CS II to reduce durab, in order to execute MM2), risky (multiple HT failures) and burns more CP than the PrudT rotation. Considering the fact that it gives 200% efficient at 100% success rate (when performed right after Observe), a total of 12 CP (7 CP on Observe, 5 CP here) is really quite nice for what it can accomplish. The only drawback is that because of its need to pair up with Observe, it takes 2 steps to perform its function, so it's difficult to buff multiple FocS's with a single Ingenuity II. This combo utilized a single Innovation, and buffed both the Adv T and the GS+Byregot at the same time. But with Observe+FocS, there is no way to fit them in like the above. However, if you're just going to fit Observe+FocS into a rotation as an extra touch (without buffs), Observe+FocS is actually a great choice since it has the same power as Adv T, but cost fewer CP and without the need of Steady Hand. In any case, it seems useful in manual crafting. But in macros, it may not be suitable since it occupies 2 lines instead of 1 line. Every line in macros is just... precious. May reduce CP consumption while status is active. When a specialist, cancelling the status grants the use of a single Specialty action. The CP consumption reduction is totally random. It can happen with an action that cost a lot of CP, or it can happen with an action that cost barely any CP. It's completely unpredictable. Personally, I found the 50 CP investment to be a waste if I am not using a specialist class that can use "The Triple R's" (see below). Sometimes, I can't even get back the invested 50 CP from the random CP reduction. Thus, I think we should only use Init Prep if we're dealing with a specialist class, and plan to use "The Triple R's". Does this skill really does nothing? Of course not. If it really does nothing, the button wouldn't exist in the first place and cost you CP! Back in the old days in A Realm Reborn, Observe was a valid skill for the "baiting" of a "Good" condition at a desired step. For instance, if you're already at your final push of quality before your Byregot's Blessing, let's say you planned to use: Steady Hand (22 CP), Great Strides (32 CP), Innovation (18 CP), Blessing (24 CP)... After you activated Innovation, you had 38 CP left. In that case, you can afford to spend another 14 CP on "Observe" to do nothing, in the hope that a "Good" or "Excellent" will appear on the next step for the Blessing. Now in Storm Blood, this has become even easier to execute as the CP requirement has been reduced from 14 to 7 CP. But its greatest function now in Storm Blood, is to pair up with "Focused Synthesis" or "Focused Touch" (See details of these skills above). Previously, Brow is available only when condition is Good or Excellent. Now in Storm Blood, it can be used even when condition is normal, making it a viable alternative for Byregot's Blessing for single-class crafters (especially Specialist, because that increases success rate to 100%). Comparing to Blessing (which efficiency is 100% plus 20% for each IQ stack), Brow is stronger when IQ stack is 5 or lower. Brow and Blessing are same in strength when IQ=6. Blessing is stronger when IQ is 7 or above. Thus, Brow isn't exactly the best replacement for Blessing, since at end-game, we are usually sitting at IQ9 or above before we proceed to our Byregot finisher phase anyway. So Blessing is still a better choice. But at least, with the help of Brow, single-class crafters become viable. ...are 3 powerful new specialist skills that are mutually exclusive. They all stem out from Init Prep. But you can only choose to use one in your rotation. - Complete the remaining progress. The advantage of this approach is that it increases IQ stack before you use your first touch, so that all the touches that come afterward will be strengthened by the bonus control from the high IQ stack. Investing 50 CP on Init Prep for an early guaranteed extra 3 IQ stacks? Well yeah, it's valid! However, its disadvantage is that it cancels out Init Prep very early, therefore Init Prep will not help much with CP reduction in the rotation when we try to push quality. Thus, we try to delay this as much as possible by pushing progress first, before Reflect is executed. Refurbish basically transforms your 50 CP invesment in Init Prep into a 65 CP return in the end. From this calculation along, it is just a net gain of 15 CP. However, due to Init Prep being active throughout your rotation, you may have saved a significant amount of CP. Since the CP reduction from Init Prep is totally random, we just don't know how powerful this Init Prep + Refurbish is until the very end of your rotation. The fact that it adds 25 durab instead of 30 is rather tricky. It means that before you use Reinforce, you need to make sure you're not having any 5 durab overhang. Otherwise, the effect of Reinforce would be equal to adding 20 durab only when the two 5 durab overhangs join together. As long as one is careful with 5 durab overhangs, one can actually gain 3 extra steps of actions using the 50 CP invested in Init Prep. 50 CP for 3 extra steps is extremely CP-efficient, as compared to 92 CP for a Master's Mend or 88 CP for a Manipulation. Together with the CP conserved by the active Init Prep throughout the rotation, Reinforce is considered quite powerful. Since Storm Blood, this skill has been buffed from 100% plus 10% per IQ stack to 15% per IQ stack. It sounds good, but so far, Byregot's Blessing at IQ11 has been quite sufficient to HQ even 2 star items. So we haven't used this skill much. We have no desires to mess around with a weaker Miracle, and then struggle to get the IQ up again for a final Blessing. Until S.E. releases some crazily difficult recipes, I believe Miracle will just be remain unused on the back-burner. Ch60: Special 2 Star Recipes in Stormblood and Ch61: Discussions Regarding Special 2 Star Recipes below for more details. Since Stormblood, the cost of this skill has been reduced from 32 CP to 16 CP, and the success rate has been buffed from 80% to 100%. I always thought Trained Hand was powerful, now it just got even better. For more details about this skill, please visit Ch42 of Caimie's Crafting Guide (Part 3 Heavensward). This passive ability increases maximum CP and current CP by 15 after you clicked your first action. It will happen 100% if you're on a specialist class. But it only happens sometimes if the class is NOT a specialist. Thus, for a single-class crafter (with specialist), this passive ability somewhat replaced Comfort Zone (ALC 50), with the exception that it can only happen once per rotation, whereas Comfort Zone is something that one can use more than once per rotation. For an omni-crafter's non-specialist class, this is not a reliable source of CP, so one cannot take it into account when designing macros. In manual crafting, if it happens to be activated by chance, then one just have to treat it as a lucky 15 CP bonus. Not everyone has a fully-melded Ironworks crafting set from Heavensward to bridge over to Stormblood. This chapter here is dedicated to help those with sub-par gear sets to transition more smoothly into Stormblood crafting. In Stormblood, the lowest shared crafting gear set ("left" gear) is the Bloodhempen set (i180) and it requires level 61 to equip. The lowest mainhand (MH) in Stormblood is i190 and it requires level 62 to equip. The lowest offhand (OH) in Stormblood is i200 and it requires level 63 to equip. 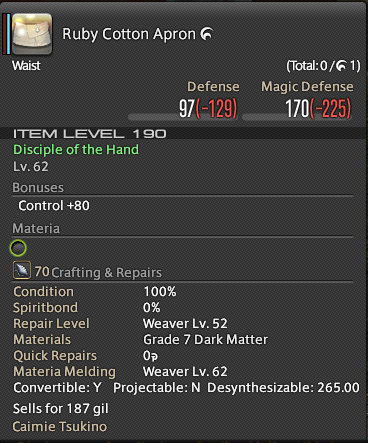 The lowest belt in Stormblood is the Ruby Cotton Apron (i190) and it requires level 62 to equip. The remaining “right” gear (Larch accessories) are all i200, and it requires level 63 to equip them. For the level 63 OH, you will actually get a FREE NQ one by completing the level 63 class quest. This is why the NQ ones are so cheap on the market (see pictures below). However, although the HQ one are much more expensive, they do have much better stats. The best way, of course, is to craft out the HQ one yourself (or ask a strong crafter to help) instead of buying one from the marketboard. (1) i150 white gear set (shared), i160 white tools & i140 white accessories. 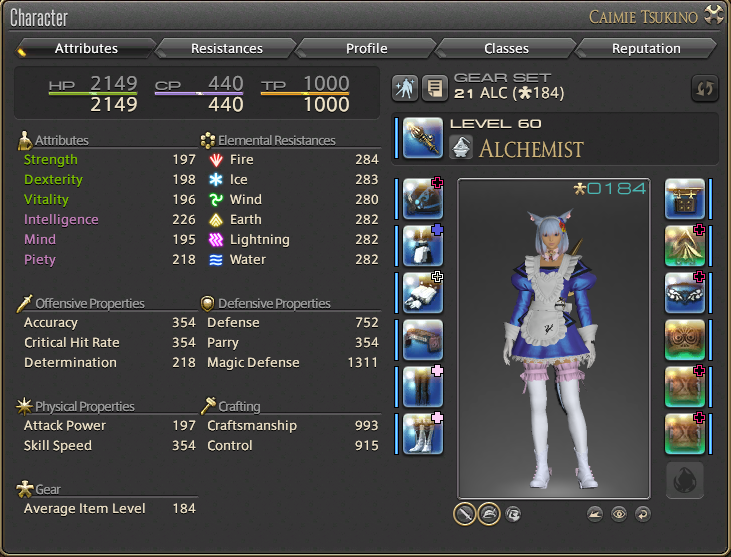 (2) i170 crafted blue gear set (class-specific), i170 blue tools & i170 green accessories. (4) i190 ironworks gear set (shared), i195 blue tools & i190 blue accessories. (1) i180 exchanged blue gear set (class-specific), i180 blue tools and i180 green accessories. Crafted gear sets are obtained by… apparently, crafting (Duh, Captain Obvious! ), and the recipes are from Master Recipe Books. So try to be up-to-date with those Master Books as you will always need them. (i) Craft out the required collectable and exchange for an appropriate counterfoil at the Splendor Vendor. (ii) Exchange the counterfoil plus Red/Blue Scrip Tokens for i180 gear. (iii) Exchange Red Scrips for goblin tokens. (iv) Exchange i180 gear plus goblin tokens for i200 gear on the goblin Grinmox. Logically, you want to be as well-equipped as possible and reach level 61 before entering Stormblood crafting (to craft level 61 recipes or above). So try your best to obtain the strongest gear set/tools you can afford while not breaking your bank. Ideally, you want to avoid all "class-specific" gear sets since they are definitely not as economical as the "shared" gear sets. But since tools are always class-specific, it is ok to acquire any tool you like. In my opinion, I doubt anyone will need anything as strong as Ironworks gear to transition into Stormblood. If you have the mats, and CAN craft an HQ Ironworks set, by all means go do it (or ask someone to help). The Ironworks are strong, and can let you play all the way until level 65. But if you are not in position to get Ironworks, it is fine. Just go for something like the Carbonweave set. As a level 60 crafter, you can probably craft it out yourself. The mats for the Carbonweave set are quite affordable. Otherwise, even just using i150 white gear is ok. If you want the i180 or i200 scrip-exchanged MH or OH, it is fine too. All you need is some grinds on red scrips, then do your exchange. These tools are quite strong, and can be used until level 65 as well. But they cannot be melded with materia. Once you have decided on your "best gear set", you want to lightly meld some materia on them to increase your stats. Since Patch 4.1, we can now freely remove materia from gear (see Chapter 64: Materia Removal below for more details). So feel free to meld ANY Tier IV or lower materia, because you can always retrieve them back at 100% rate. You can meld some Tier V too if you wish, but you may not be able to get them back later since you will have only 80% chance of retrieving them. DO NOT waste Tier VI materia here please. And don't do any crazy overmelds. Personally, I highly recommend boosting your CP if you're a skillful crafter. With CP, you can become super flexible with your rotation designs. I do not oppose to the idea of melding craftsmanship or control though, at an affordable manner. With the HQ Bloodhempen set (i180 level 61), you should have no problem making the HQ Ruby Cotton Set (i200, level 63). With HQ Ruby Cotton Set, you can pretty much grind to level 70. Perhaps you can change a tool or a chest along the way (I prefer to upgrade my tools once along the way to level 70), but there's no need to get every single pieces of upgrades before you reach level 70. NoahG (Camille Gainsborough from Hyperion) has a suggestion for people who would like to spend nearly no gil. NoahG can confirm that you can even be wearing the Adept's Gown (only i130) bought from Moogle vendor using Carved Kupo Nuts, and still be able to farm Red Scrips for CUL. Then with a well-geared CUL using the exchanged i200, you can cheaply macro a ton of Baklava collectibles and continue farming Red Scrips until you can gear up your WVR and LTW to make a full set of HQ Bloodhempen gear. - The i190 Ironworks set is very expensive to buy. It's good if you can obtain one since it can last until level 65, but it is not necessary. - The i170 Carbonweave set is very sufficient for crafting things at the beginning of Stormblood (from level 60 to level 63/64). - If you cannot afford the Carbonweave set, the i150 white gear is still ok. Just don't waste too many materia overmelding it since you can replace it with the Bloodhempen set at level 61. Remember to retrieve your materia from the old gear set when switching to a newer gear set. - The i140 Hallowed Chestnut (white) accessories are OK. Even if you're using them, you can still do fine. Since you will be switching to another set of accessories in Stormblood, you do not need to penta-meld them like I did back in HW. - The i170 Astral Birch and Aurum Regis accessories are very strong, and can be utilized until level 63/64. - The i190 Ironworks accessories... To be frank, you really don't need to spend so much gil on accessories as they can be replaced by the i200 Larch accessories at level 63. - The Bloodhempen set (with Gaganaskin Halfgloves and Shoes) is the lowest crafting gear set in Stormblood, which can be equipped at level 61. 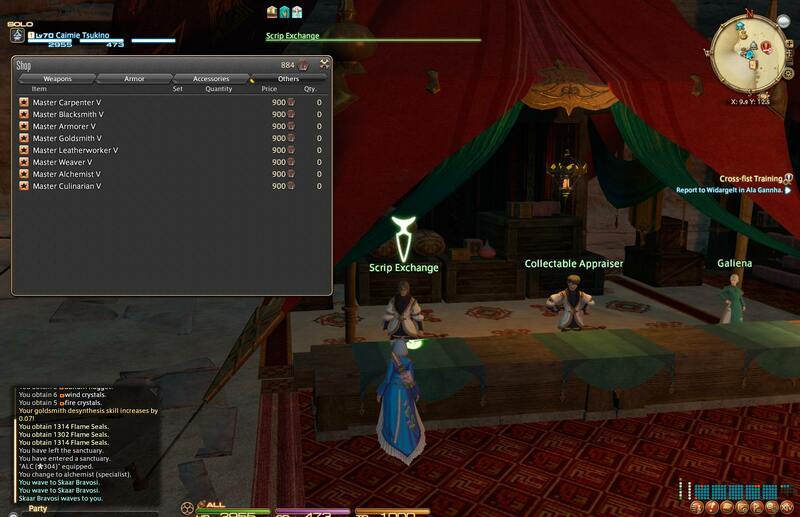 - The Ruby Cotton Apron (i190, level 62) and Larch accessories (i200, level 63) are the lowest crafting accessories in Stormblood. - The lowest MH tools in Stormblood require level 62 to equip. The pictures above demonstrates how big the differences are between the stats of an HQ tool vs the stats of an NQ tool. - The lowest OH tools in Stormblood require level 63 to equip. The pictures above demonstrates how big the differences are between the stats of an HQ tool vs the stats of an NQ tool. But at the same time, the NQ tool only costs 825 gil!!! This is because the NQ tool can be obtained for FREE from level 63 class quests. (a) Grand Company Supply/Provision Missions are as good as they have always been. This is something that you should be doing each day assuming the items requested by the GC isn't too expensive. Sometimes the item you need may actually be cheaper to be purchased directly from the marketboard (MB) than to make it yourself. So make sure you check the availability of each of these item on the MB before you start crafting them. Personally, I play on a PC. So without even visiting the GC, I would press the keys "Ctrl U" on my keyboard to open up the listed of wanted items by the GC supply missions. Then just copy item name, and paste it onto the opened window of the MB. Then check price, and buy if it's cheap. If it's expensive, then I start considering crafting it myself. As we all know since ARR, "STARRED" items give 2X EXP. Handing in HQ items also give 2X EXP. Handing in an HQ item to a "STARRED" item on the list gives a superb 4X EXP. And it is because of these crazy 4x EXP turn-ins that GC supply missions are sometimes much better than leves or collectables. - Open the marketboard (MB) window together with the GC provision missions item list. Then just copy and paste the names to the MB to check how cheap or how expensive each item is. Then decide on buying or crafting it. (b) Tradecraft Leves are still as fast and expensive as they have always been. 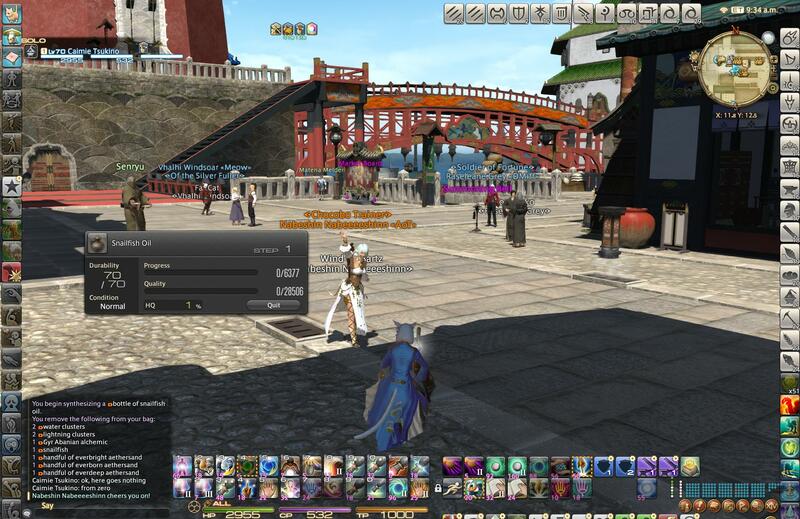 Stormblood's Tradecraft Leves are located in Kugane. Once you have unlocked this place via the main story quest, you can then access these leves. However, I strongly advice against using leves too early. They're just a luxury. 9/10 people I know, they would complain that leves drained their gil. And they would complain how poor they are when leveling DoH classes. This should not happen! Don't throw your cash too quickly into leves when you're still as low as level 61 to 65. You CAN use them, but I would recommend not to go overboard and break your bank. Personally, I used some leves around level 67 to 69 to help push EXP. Keep in mind you don't always have to use the highest leves available. You can always click on a lower level leves, and utilize them if you find them to be more cost-efficient. (c) Collectables offer an alternative to leves if you run out of allowances, and it gives you scrips in return as well. (d) Custom Deliveries are relatively new crafting contents. Custom delivery for "Zhloe Aliapoh" was introduced near the end of Heavensward. 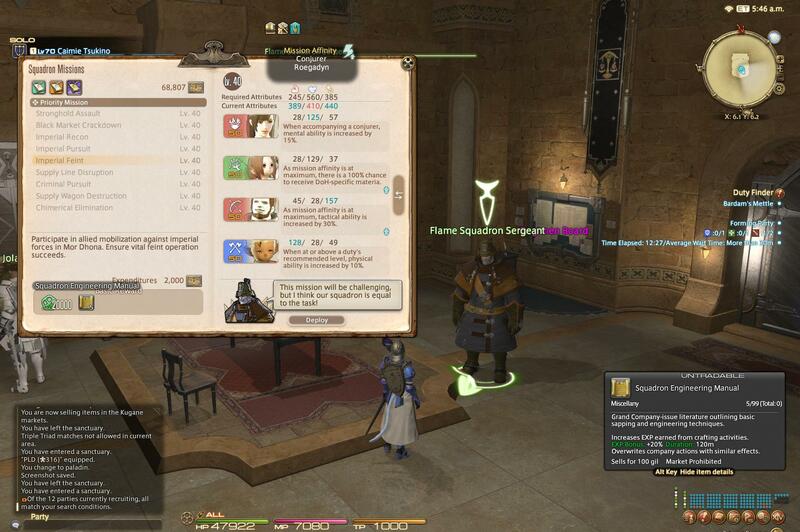 Custom delivery for "M'naago" was introduced in Stormblood (Please see Chapter 65: Custom Deliveries for more details). Both are very good for earning EXP between level 60 and 70. What's most amazing about them is that you can earn a ton of Red Scrips and Yellow Scrips along the way, which are very useful in buying gear, materia and crafting mats. 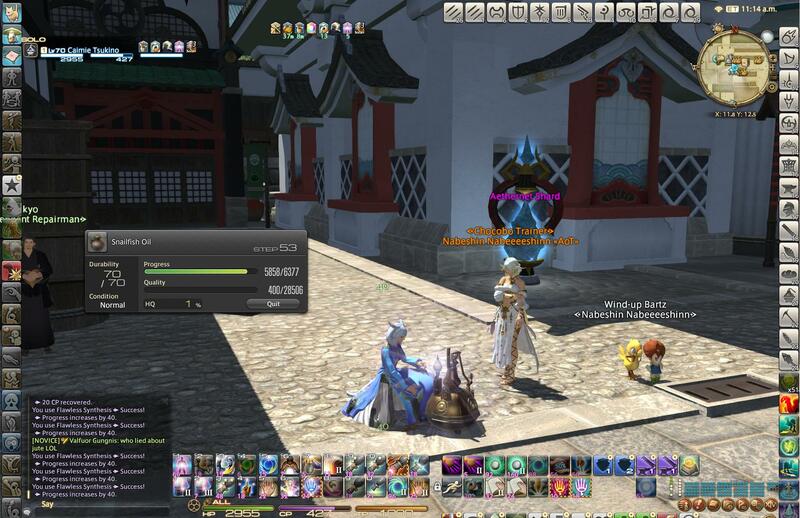 ----- (e1) Log off in FC houses in order to gain "resting EXP bonus" (the blue bar on your EXP bar). 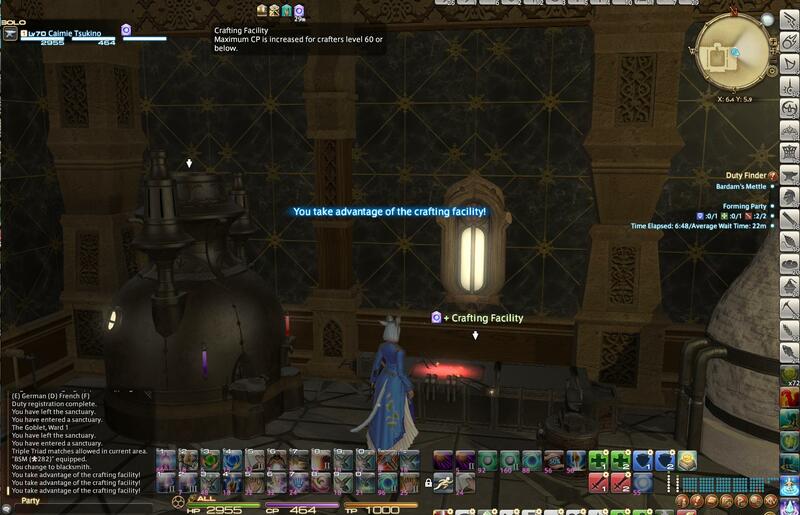 Crafting inside FC houses or inside your private chamber inside an FC house will also continuously increase your resting EXP bonus even though you're crafting but not resting in there. 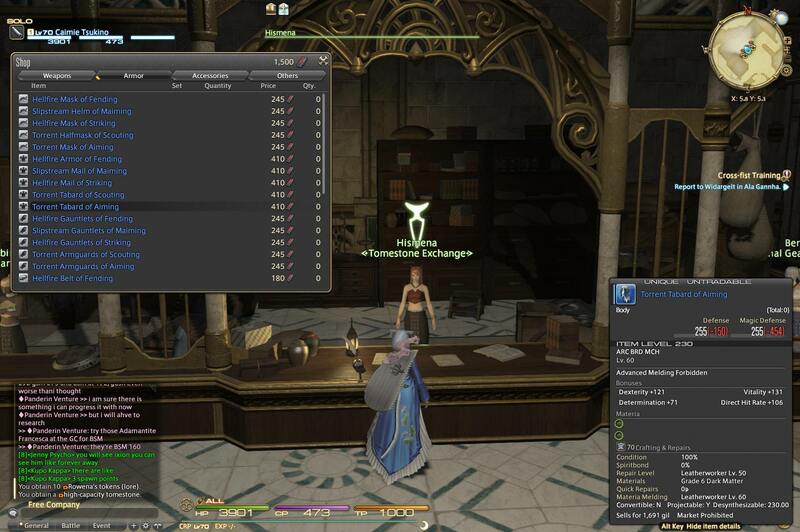 - As long as you're inside the FC house or FC house private chamber, your resting EXP bonus (blue bar pointed by the red arrow above) will continue to grow, regardless whether you're online or offline. ----- (e2) Use food to gain an extra 3% bonus EXP, as well as to gain more CP for better rotations (See Chapter 58 below for more details). - Any food can provide 3% bonus EXP. ----- (e3) Ask your FC to activate FC buffs for you. "Helping Hand II" can increase your EXP gain by 10%. Also, some FCs may have crafting facilities. These facilities can increase CP by 10 for free if you're level 60 or below, and as long as you stay inside the FC house. - Helping Hand increases EXP gain by 10%. - Crafting facilities can increase CP by 10 if you're level 60 or below. ----- (e4) Pop a Commercial Engineering Manual (150% EXP boost, up to a max of 300,000 EXP, lasts 1 hour). These things are bought with scrips at any Scrip Exchange NPC. Alternatively, Squadron Engineering Manuals (20% EXP boost, NO MAX LIMIT, lasts 2 hours) are pretty good too. The Company-issue Engineering Manual from Grand Companies used to be pretty good too back in ARR. But in SB, they provide way too few EXP before they expire. So they're not useful at all in Storm Blood. - Commercial Engineering Manuals are pretty good. Each cost only 30 Red Scrips now. Great value. - Squadron Engineering Manuals are pretty good too. They only provide +20% EXP, but they have NO MAXIMUM LIMIT, and each lasts 2 hours instead of 1 hour. - With only a maximum of 50K EXP points, Company-issue Engineering Manual are too weak for leveling in Storm Blood. I believe the best strategy would be to utilize multiple methods for leveling. 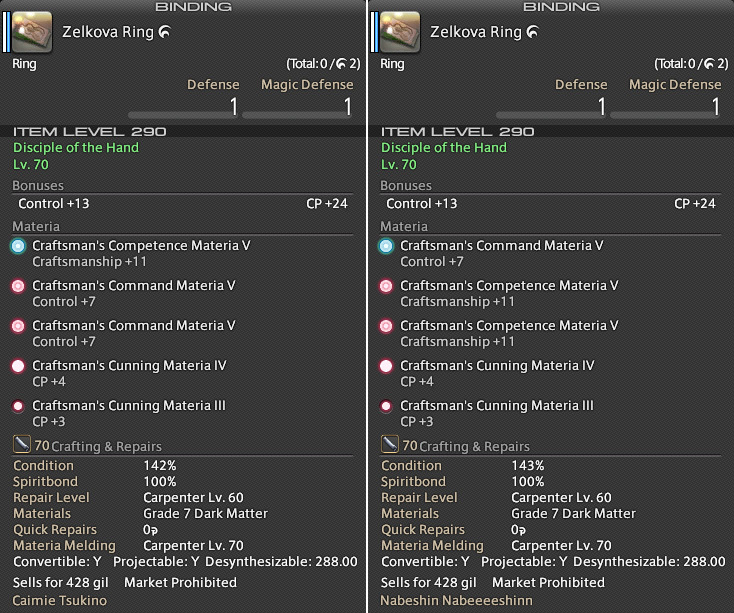 When I was between level 60 and 64, I used a combination of (a) GC Supply Missions, (e) Leveling by actual crafting, and occasionally used (b) Tradecraft Leves. When I reached higher levels, I started using more leves to accelerate the process. 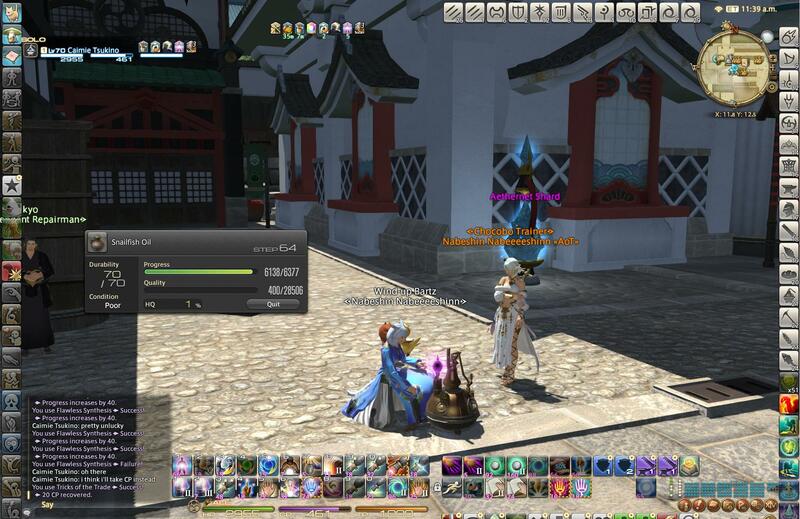 When I was leveling at the beginning of Stormblood, M'naago's custom delivery was not even introduced into the game yet. But these days, I have heard of numerous feedbacks about (d) Custom Deliveries giving a very generous amount of EXP. So I think adding that into your leveling strategy would be very beneficial. Below, I will explain my strategy of how to execute (e) Leveling by actual crafting... Basically, you want to be able to macro your way through the crafting of stackable HQ crafted mats, so that you can just keep pushing 1 or 2 buttons to get the job done (while watching TV or movies). Keep in mind to try your best to utilize (e1) to (e4) whenever you are leveling by actual crafting. They really add A LOT more EXP! Keep in mind that EXP is earned with every quality you push out on the quality bar. So even if you failed to make an HQ item in the end, but if you have pushed most of the quality to nearly max, you will still get substantial amounts of EXP. Thus, it is important to note that using HQ mats to make HQ products will actually reduce the amount of EXP gain per item. To maximize your EXP gain, it is best to use pure NQ mats to produce HQ products. But of course, the ability to do so will depend on your gear, stats, available cross class skills, as well as how good you actually are with crafting. At lvl 60, it is extremely difficult to craft lvl 61 recipes. So I'd rather go back and grind the old Heavensward recipes until lvl 61. For e.g., Adamantite Nugget (lvl 58 recipe) and equivalent recipes are the highest level of stackable crafted mats. Since they're stackable, they're very convenient for macro-crafting. When I was at end-game Heavensward, I was in materia-melded i190 Ironworks gear set (but not all Ironworks accessories... I had a few pieces of i170 melded accessories), and I was using i195 tools (melded with only CP). My CP pool was 473 after consuming HQ Baked Onion Soup. So after executing (e1) to (e4) above, I just keep pressing the macro button to make HQ adamantite nuggets. Keep in mind that EXP comes from how much quality you push on the quality bar per synthesis. Hence, unless you really have trouble HQ-ing a product, do your best to AVOID USING HQ raw mats, as it will reduce the amount of EXP gain per crafted product. If you have access to only HQ raw mats, right click ("Square" button on PS4) on it, and select "Lower quality" to turn the raw mats into NQ. 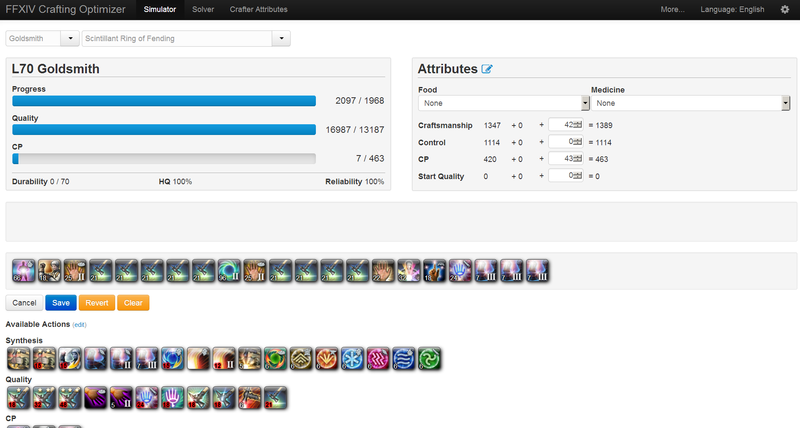 - Click "Crafter Attributes" at the top horizontal menu, and enter your own stats there. - Click on "Simulator" at the top menu again. Select the class and recipe. - Click "EDIT" on the right side of the screen. - You can now freely test the outcome of different crafting skills. Now keep in mind that, despite the crafting simulator being an extremely convenient tool, it is NOT 100% accurate. So if it tells you that you need 1035 craftsmanship for something, don't go for exactly 1035 craftsmanship. Always shoot for a slightly higher number to prevent yourself from botching a synthesis. 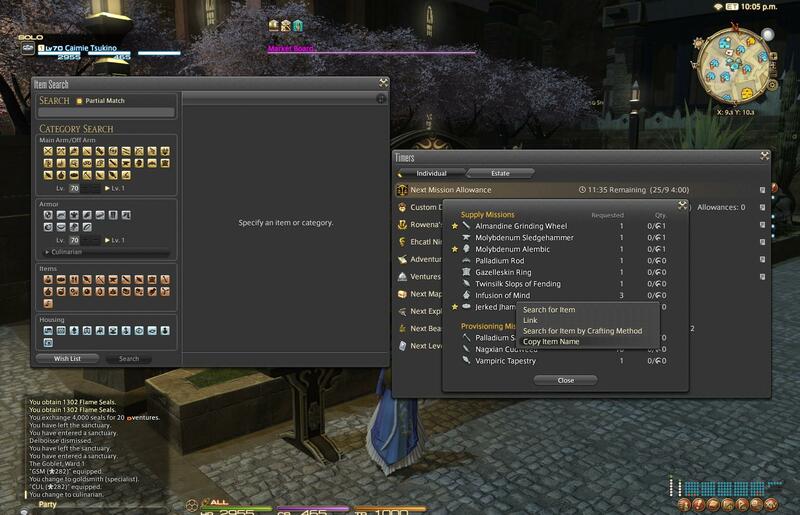 - FFXIV Crafting Optimizer is an extremely convenient tool to test rotations. At lvl 61, you can now start making the stackable 40 durab items in Storm Blood (like High Steel Nugget, Koppranickel Nugget, Bloodhempen Yarn etc... with 558 difficulty). You can use exactly the same rotation above for these recipes. Again, I'd like to remind you that I constructed these rotations/macros for my own. 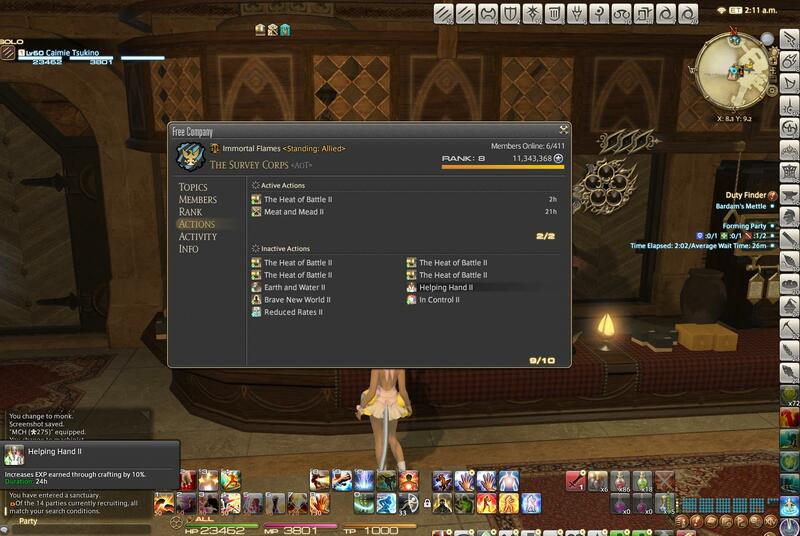 So I strongly suggest using the FFXIV Crafting Optimizer to determine whether you can utilize them with your own stats. For instance, check to make sure you can complete the item with your current craftsmanship level. At level 65 or 66, you must work on your class quest and make sure you obtain Manipulation II to pair up with Prudent Touch that you will obtain at level 66. As mentioned in the previous chapter, these two skills form an incredible combo that can be used to tackle almost anything down the road. So it is essential to obtain them ASAP, and incorporate them into your rotations. After acquiring level 70, and after crafting out your own set of i290 white gear, you can then refine your macros for 40 durab items (1353 difficulty) and 80 durab items (2952 difficulty). The following macros require very minimal stats from level 70 crafters. When I developed these macros, I had 1265 craftsmanship and 1126 control. You can likely have less stats than this, and still use these macros. Check on the crafting simulator above if you have doubts. The beauty of these macros is that they have extremely low CP requirements. So you can massively craft things without food or using just Stone Soup. So far, the best food of choice appears to be Tempura Platter. 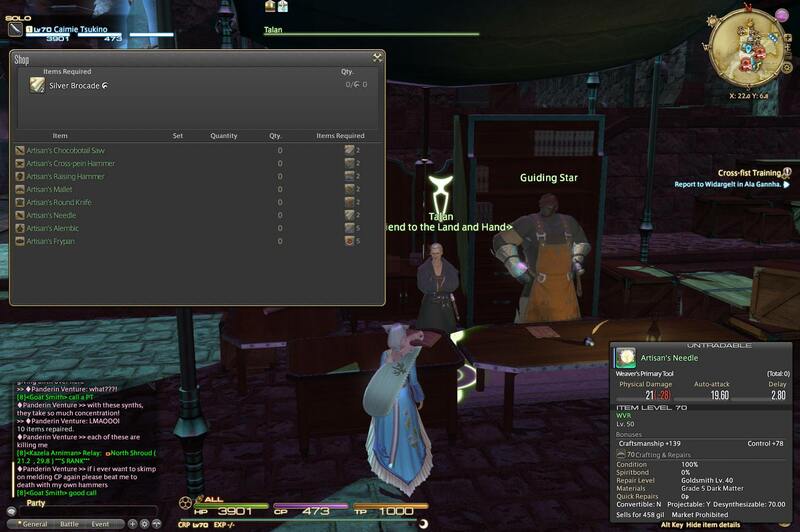 The NQ version can be purchased from a vendor located at Kugane (12.2, 12.7) for 2,186 gil. The HQ version has to be crafted, and is widely considered the strongest CP food in Storm Blood. It is often used for 2 star crafting. HQ Seafood Stew from Heavensward is still a top notch food choice for end-game crafting. It provides a ton of CP and a good boost on control. I currently use it for macro-ing Special 2 star recipes in conjunction with Cunning Craftsman's Tea (see medicine below). HQ Baked Onion Soup from Heavensward is still a pretty powerful food for crafting in Storm Blood. The mats are really cheap, and as a level 70 CUL, it's extremely easy to mass produce them. So I actually used these when I was leveling my classes from 60 to 70. NQ Stone Soup is still one of the cheapest yet most useful go-to food. 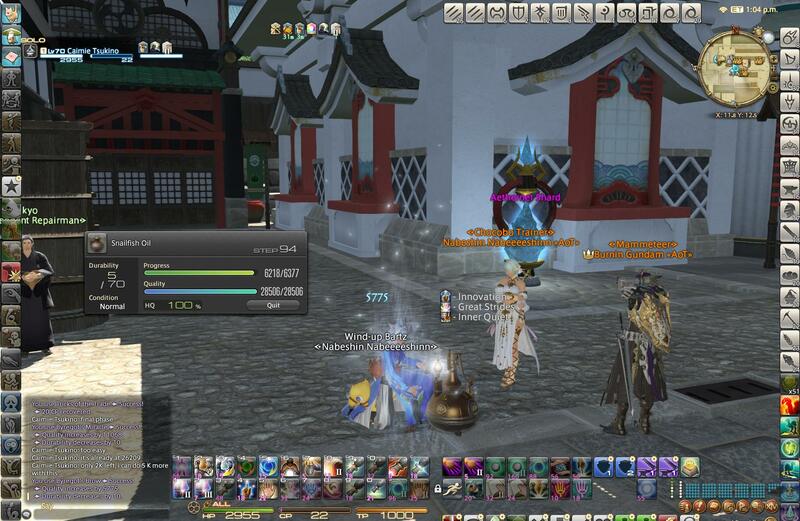 It is only 37 gil from the Gold Saucer Tap Keeper - Grege (x5, y6.5). So freely pop any at will. Each food has a duration of 30 min. But in Stormblood, up to 2 of the same food can be used at the same time to increase the duration to 1 hour. Apart from food, medicine has now been introduced to the crafting world in Stormblood. Each medicine has a duration of 15 min, and can be used in conjunction with food. So you can have both the food buff and the medicine buff together simultaneously. Personally, I haven't used any Competent Craftsman's Tea or Commanding Craftsman's Tea, because I haven't found a need for them yet. But I have tried NQ Cunning Craftsman's Tea and HQ Cunning Craftsman's Tea. I found them to be quite useful, especially for Stormblood 2 star and special 2 star crafting. Each medicine has a duration of 15 min. The effect of medicine cannot be stacked. That is, you cannot use two of the same medicine at the same to increase duration. The 2nd medicine will simply overrides the first, and the duration will refresh at 15 min. Master Recipe Books V were released at the beginning of Stormblood. 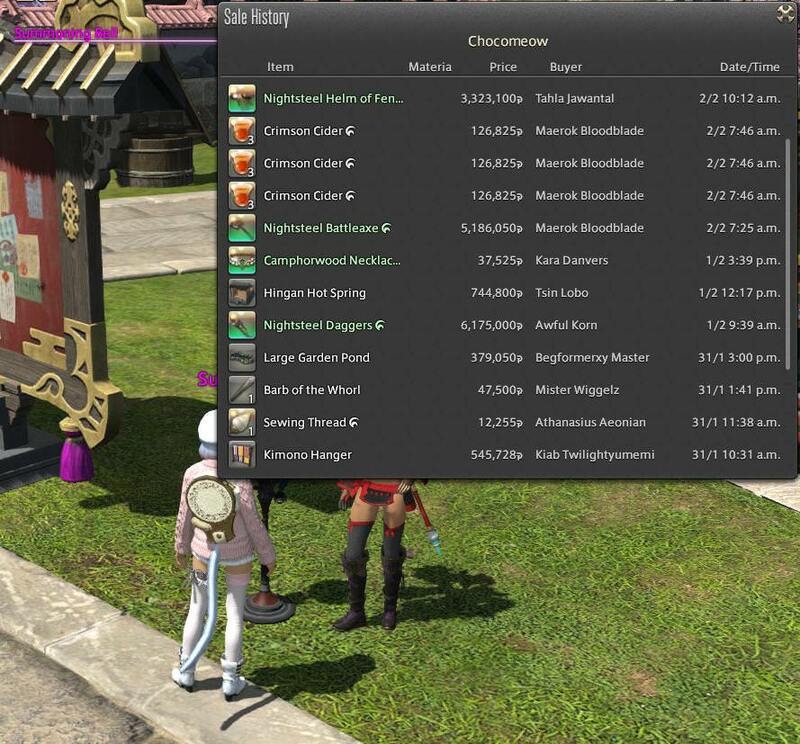 As of Patch 4.15, they contain 1 Star, 2 Star and Special 2 Star recipes, and will likely to have even more starred recipes added in future patches (NOTE: Some Stormblood 1 Star recipes are located in just the list of regular recipes, and some are located in Master Recipe Books IV as well). The books are purchased using 900 Red Scrips each from the Scrip Exchange NPC located in Rhalgr's Reach. 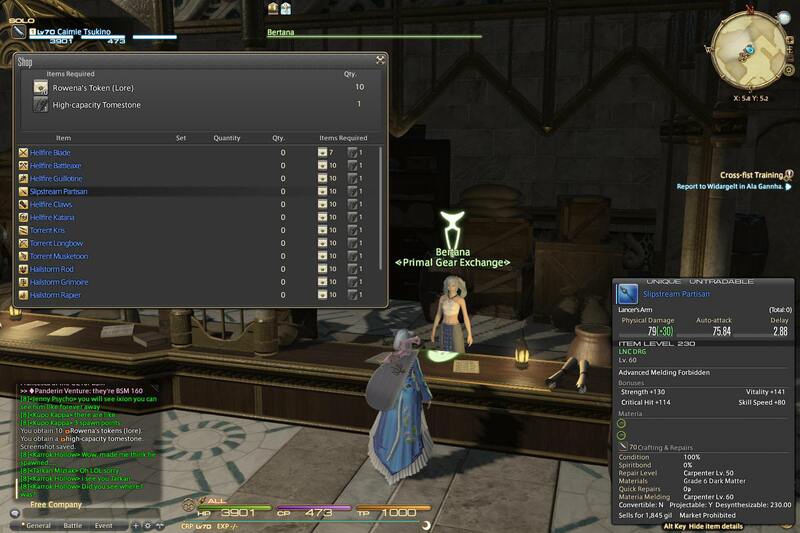 - Master Recipe Books V are located under the 2nd option (Red Crafters' Scrip Exchange (Lv. 61)). Click the "Others" tab to show the books (see below). - Each Master Recipe Book V cost 900 Red Scrips. 3149 Difficulty, 14071 Quality, 70 Durab. Minimal requirement by the game: 1100 craftsmanship, 1080 control. Since 2 star crafting requires 1320 craftsmanship and 1220 control (see below). 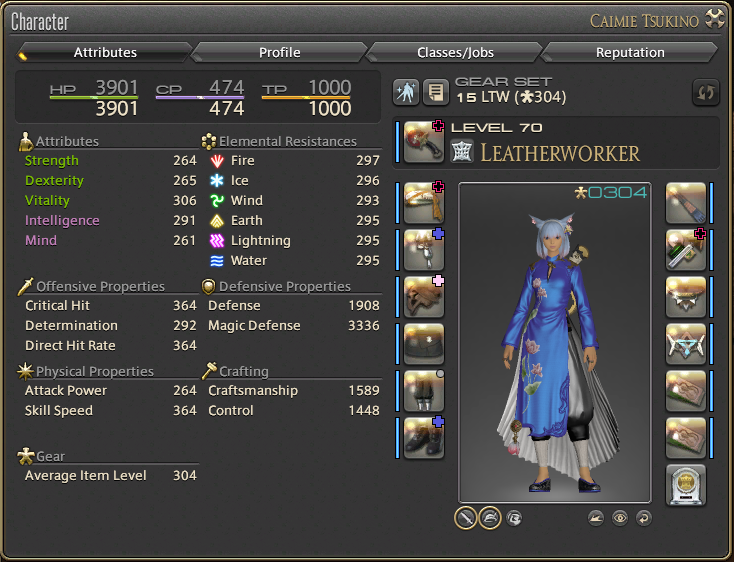 All crafters are expected to overmeld their i290 gear to reach at least the 1320/1220 stats. There are many 1 star rotations out there. Below is the one that I generated to fit my own stats. This rotation can be used by anyone with at least 1320 craftsmanship, 1220 control and 490 CP. It will reach 100% HQ for any 1 star item using pure NQ mats. 3543 Difficulty, 15837 Quality, 70 Durab. Minimal requirement by the game: 1320 craftsmanship, 1220 control. It is recommended to achieve slightly higher craftsmanship than the minimum. I would suggest at least 1330 or higher in craftsmanship after consuming food. This is because some of the rotations below requires 1330 craftsmanship. 2 star crafting has long been considered "MACRO-SOLVED". It is not anything new or difficult. We can effectively macro 2 star recipes from zero to near-max quality if we include the use of 1 Patient Touch in the rotation. Else, using a little bit of HQ mat will allow you to utilize a rotation with all touches at 100% fidelity. Below is a list of different 2 star rotation macros. All of them work fine. It really depends on your stats, and which you like most. 6377 Difficulty, 28506 Quality, 70 Durab. *Specialist Recipes - Crafter's Soul Crystal is required to craft these recipes. 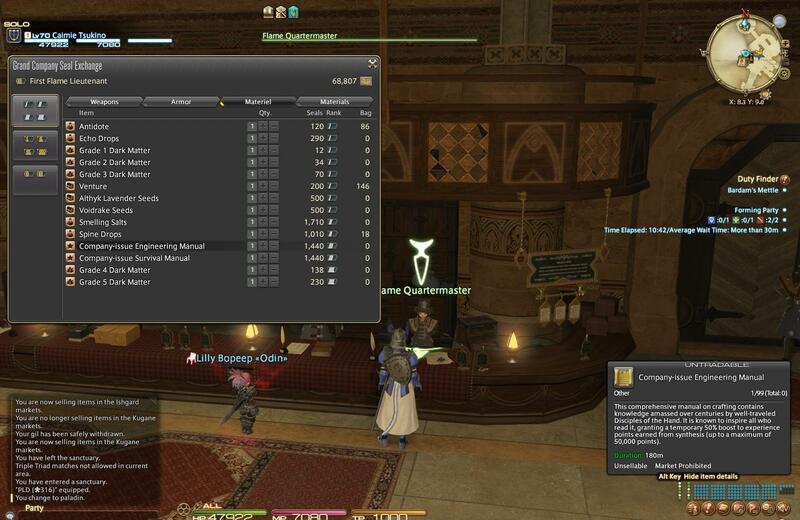 - As of Patch 4.2, these recipes are no longer specialist recipes. - As of Patch 4.3, these recipes' difficulty has been greatly nerfed... difficulty reduced to 3188, and quality reduced to 22171. In other words, instead of being the most difficult items (harder than 3 star) to make in this game, they have become some measly "1.5 star recipes"... BOO! Because of this great nerf, we no longer require the following rotation(s) for these items. Furthermore, the next two chapters that were originally dedicated to making these items have become rather obsolete now (Thank you, SE, for killing a few chapters of my guide!). However, the manual rotation explained in these chapters is still a very strong approach for any strong recipes in the future. For instance, it's Patch 4.3 right now, and this rotation can be used to craft any of the new special 3 star recipes (3943 difficulty, 29579 quality). These special 2 star recipes are significantly harder than the regular 2 star recipes in the previous chapter. As of Patch 4.1, we can acquire i320 left gear. Even after overmelding them to near-max, we still cannot effectively macro these recipes without the use of HQ mats. MaMa rotation will be a lot stronger, but it is horrendously long. Initial Prep rotation is a lot shorter, but it lacks power. MaMa rotation relies on a bit of RNG. But as long as we're not too unlucky, we can increase the quality bar from ZERO to near-max. So no HQ mat is needed. There are many MaMa rotations out there, I am listing my own below with explanations. Craftsmanship: can be as low as 1330, but preferably 1441 or higher. Control: can be as low as 1220, but preferably 1318 or higher. CP: can be as low as 475, but preferably 510 or higher. *Note: Even though these recipes are no longer Specialist Recipes since Patch 4.2, the rotations I developed below were designed for specialists (e.g. using Byregot's Miracle, Brow or Initial Prep). Because when I designed them, we had to equip the Soul Stone to craft these items. - Start off with Maker's Mark (MaMa). - Activate Comfort Zone (CZ). - Activate Inner Quiet (IQ). - This phase consists of Steady Hand II (SH II), Piece by Piece (PBP) x3 and a Patient Touch (PaT). The point is to push progress, get a jump on the IQ stack, and most importantly, reduce durab from 70 to 30, so that Manip2 can be used next without overshooting max durab. - If a "Good" pops any time during this phase when you're going to use PBP, use the Patient Touch on it to gain 1.5x quality. - If a 2nd "Good" pops, take the Trick of Trade (ToT). - If your Patient Touch fails, you have 1 more chance to do it again while SH II is active. - If you're just so unlucky that 2x Patient Touches fail, abandon it for now, and proceed with the next step. - If your 1st Patient Touch succeeds, you will have 1 step of SH II left. At this point, don't waste it. Do a Flawless Syn to use it up. - Now durab is 30 or 20. - Activate Manip2 (the point of this is to burn away a big chunk of CP as early as possible while not overshooting max durability, which maximizes the amount of ToTs to be taken during FS-spam phase). Now PBP Phase is complete. - Keep spamming Flawless Syn (FS) (at 90% success rate) while refreshing CZ whenever it falls off. And take ALL available ToTs until CP is maxed. - If an Excellent pops early in this phase, I recommend ignoring it, and take the ToT, since it's more important to make sure you have sufficient CP. - If an Excellent pops very late in this phase, and you already have plenty of CP (taken at least 4 to 5 ToTs), you have the choice of gambling with a naked Precise Touch (70% success rate). If succeeded, you will increase your IQ from 3 to 5, and will increase quality by a lot at the cost of 18 CP and 10 durab. If failed, instead of gaining CP, you will lose 18 CP together with 10 durab. - Keep spamming FS until MaMa falls off, or until just before completion of the item. 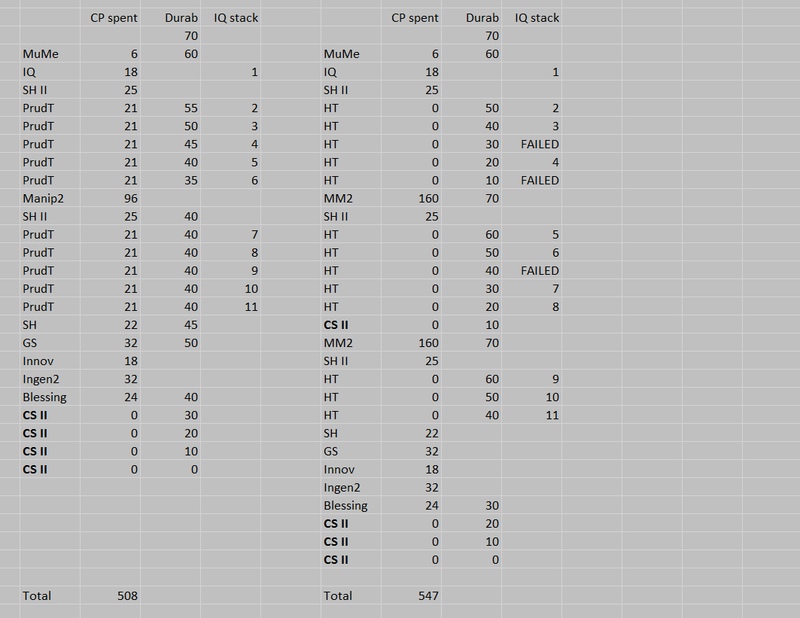 - SH II, and then spam Prudent (you can also mix in some Hasty Touches to save CP, but it will decrease durab faster). During this phase, refresh CZ if it falls off. - You want durab to fall to 50 or less, so that you can use Manip2 before the 2nd round of touches. - If you have very much maxed out CP in Phase 1, you can choose to use Precise Touch if a Good happens. Definitely use Precise Touch if an Excellent happens. - If you are far from maxing out CP in Phase 1, you can choose take ToT here instead. - Before entering Round 2 of Touches, activate Manip2 to recover durab. - Spam Prudent Touches and/or Hasty Touches until SH II falls off. - Can take ToT or use Precise Touch if a Good shows up. Definitely Precise Touch if an Excellent shows up. - Refresh CZ one more time before entering Round 3 of Touches. - Spam Prudent Touches and/or Hasty Touches until durab is 25, and make sure to save at least 167 CP for your Finisher Phase (and 7 more CP if you need to use CS III to complete the item instead of CS II). - If you run out of CP and yet SH II fell off, you can still keep using naked Hasty Touches until durab = 25. - Try to aim at finishing this round at 25 durab instead of 30 durab. Letting it fall to 25 basically means letting yourself having 1 extra touch. - You MAY refresh CZ one more time in this phase depending on the situation. If you know for sure you will have enough steps to retrieve all the invested CP, you can do one more CZ. Otherwise, leaving it out is not going to hurt. Ironic enough, the more CP you have obtained in the earlier phases, the more "room" you will have to execute one more CZ (even though if you have taken enough ToTs already, then you actually don't need CP as badly). - Activate Innovation (if a Good appears before you use Innovation, you can skip Innovation here and press Miracle first, then press Innovation after the Miracle). - Finish up with either a CS II or CS III. This synthesis will still be under the influence of Ingen2. If you need a CS III to complete the item, make sure you saved another 7 CP for it. MaMa Rotation is strong, and allows the pushing of quality from zero to max. However, it's wayyy too long. If you want a shorter rotation, you have to use the Initial Prep Rotation approach. There are many Initial Prep rotations out there. I am listing two below. Both utilizes only actions with 100% fidelity. So there's zero RNG involved. However, both rotations cannot increase quality from zero to max. It is necessary to use some HQ mats. If you have approximately 1500 control, you can use just 2 HQ mats, and it will bring your final HQ rate to ~91%. The first one is by Tony Greco (Actually he learned it from someone else, and modified it... I don't really know who's the original person who built this. I also modified it slightly here). Tony claimed that this rotation works with as low as 1500 craftsmanship. Required CP is approximately 528. Keep in mind that Initial Prep may or may not reduce the CP consumption of certain skills before it is dissipated on the step of Reflect. Thus, the total CP required could very well be lower than 528. The second rotation is by Tayler1480, and slightly modified by me. The original rotation utilized another "Observe+FocSyn" at the end instead of the CS II shown below. So the craftsmanship requirement was lower, but it required more CP. Here, I utilized 1584 craftsmanship (approx amount... simulators are never accurate with progress... do not trust the minimal value! ), and managed to complete the item with a CS II as the finishing step. This saves a significant 12 CP, reducing the CP requirement from 543 to 531 CP (after materia overmelding, you can reach this amount of CP using both food+medicine), and also reducing the number of steps to a perfect 30. So we can put everything into two macros. Comparing the two rotations, the modified Tayler rotation gives a tad bit more quality. But it requires a bit more craftsmanship and 3 more CP as well. Tayler's rotation is also 2 steps longer than Tony's. Here is a 3-part macro to break the above 2-part macro into 3 parts. This can prevent the Blessing to fall onto a "Poor". Here you are allowed to stop and check the condition before the Ingen step. If it's Excellent there, manually press Blessing, and then do Ingen and the rest of the synthesis. As we can see, Ingen2 is NECESSARY, and it's stronger than Innov. This is very different from ARR or HW crafting which "Good" > Innov+Ingen2. Here, Ingen2>Good. GS+Innov+Blessing on Good will get only 6087 x 1.5 = 9130 quality. Thus, GS+Blessing on Good is completely out of the question. GS+Ingen2 is ESSENTIAL. Only after that, if you get a Good, you can skip Innov for the Blessing. ...with Innov and/or Ingen2 being dispensable if a Good appears after GS. ...with GS and Ingen2 being just as important as each other, and only Innov is dispensable if a Good appears after Ingen2. SH II, GS, Ingen2, Innov, Miracle (IQ down to 6), GS, Brow. SH, GS, Ingen2, Innov, Blessing. In Variant A, the Miracle gave 9540. The Brow gave 5021. Total = 14561. In Variant B, the Blessing gave 11448. The quality difference between the two variants = 3113. Variant A needed a total of 167 CP. Variant B needed a total of 128 CP. The CP difference between the two variants = 39 CP. At IQ11, my Prudent Touch or Hasty Touch under Ingen1 gives 1487. Thus, you can imagine if I am using Variant B (with Blessing), I must do two at least 2 more Touches under Ingen1 at IQ11 to be just on par with Variant A. And I have an extra 39 CP to do that. Prudent Touch cost 21 CP. Thus, even two of them will cost 42 CP. Chances is that 39 CP is not going to be enough for 2x Prudent (especially we need these touches to be under SH II and Ingen1). It is more likely that we'll just end up with 2 extra Hasty Touches instead. Because Hasty Touches are not 100% secure, it seems difficult for us to do enough with that extra 39 CP to obtain 3113 more quality in Variant B. Therefore, I believe Variant A is stronger, in general. In conclusion, we should save up 167 CP to do the "Miracle+Brow" ending instead of saving 128 CP for the "Blessing" ending. However, if one runs into a situation where there're plenty of durab left, but just not enough CP, one could forfeit the Miracle+Brow approach to immediately gain access to 39 more CP. By activating SH II at least, one can at least push 5 more steps of Hasties to burn off those extra durab (hopefully add up to ~3K quality). And then proceed to the 128CP-Blessing finish. Can't Improve Initial Prep Rotations with "Miracle+Brow"
Since both Initial Prep rotations utilized the "Blessing" approach, some friends and I tried very hard to improve the Initial Prep rotations with the "Miracle+Brow" approach. However, to our dismay, we were unable to invent anything better than the above. This is because, although the "Miracle+Brow" approach has been proven stronger in a MaMa rotation, there were just too many restraints when we are dealing with an Initial Prep rotation, including limited durab, limited CP, limited number of macro lines and limited ways of fitting skills together in a more effective way. Since the rotations here utilizes only 100% secure touches, my friends and I wondered if we could subtitute the Prudent Touches with Patient Touches to increase quality despite introducing RNG. However, we found that when we substitute the Prudent Touches with Patient Touches, we start losing durab too fast, and at the end, we simply don't have enough durab to do as many as 7 touches as these rotations. Hence, despite introducing RNG and reaching the same IQ stacks, there was a reduction of quality due to having fewer actual touches made. Our conclusion is that the above two Initial Prep rotations are probably as good as they can get. *As of Patch 4.3, the game has introduced i340 gear. Thus, it is not necessary to acquire a whole set of the i320/i325 Ala Mhigan crafting set. You may send the mats to an accomplished crafter to help you make the new Patch 4.3 crafting gear before you overmeld with materia. As of Patch 4.1, the game has introduced the i320 left gear (shared white gear) and i325 mainhand tools (MH) for crafters and gatherers. No belt, no accessories and no offhand tools were released in Patch 4.1. The new gear and tools are all Special 2 Star Recipes (Specialist Recipes). As usual, WVR makes the head, chest and pants. LTW makes the gloves and boots. BSM makes the MHs of BSM, ARM, CRP, GSM, LTW, MIN and BTN. ARM makes the MHs of ALC and CUL. GSM makes the MH of WVR. Comparing with the i300 yellow scrip gear/tools released in Patch 4.05, these crafted gear are much more worth your time to obtain. The i300 yellow scrip MH costs 1300 yellow scrips each. 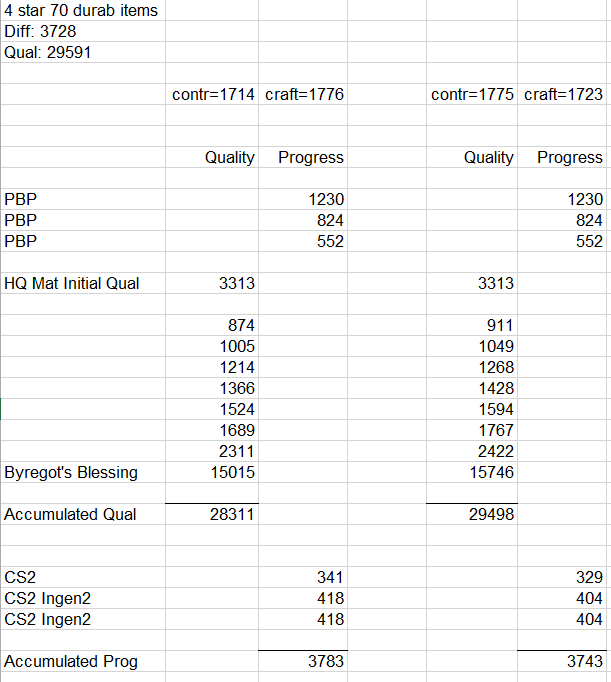 Whereas the i325 crafted MH costs only 750 yellow scrips each (needed 3 "alchemics", see below). Plus, the i325 can be melded with more CP, so they're much more desirable than the i300 tools. 3x Snailfish Oils are required to make each i325 MH. And 2 to 3x Ala Mhigan Fibers are required to make each i320 left gear. To craft Snailfish Oils and Ala Mhigan Fibers, one needs a raw mat called "Gyr Abanian Alchemic", which costs 250 Yellow Scrips each at the Scrip Exchange NPC at Rhalgr's Reach. 1 alchemic makes only 1 oil or 1 fiber. So it's a pretty big yellow scrip grind. - Gyr Abanian Alchemic costs 250 yellow scrips each at the Scrip Exchange NPC at Rhalgr's Reach. Both Snailfish Oil and Ala Mhigan Fiber recipes belong to our beloved ALC. Thus, it is highly recommended that you first switch one of your Specialists to ALC to facilitate the making of these items. 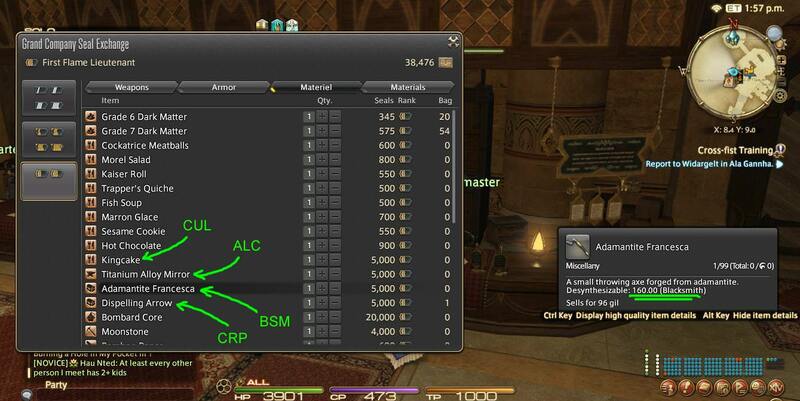 In fact, your first priority will be to gear up your ALC to max, so you can more easily HQ these items. As of Patch 4.1, we can switch specialist classes up to 3 times per week. To switch specialists, you need to bring with you a "Soul of the Crafter" and speak to Alderan at Foundation. New "Souls" can be purchased with 480 Red Scrips at any Scrip Exchange NPCs. 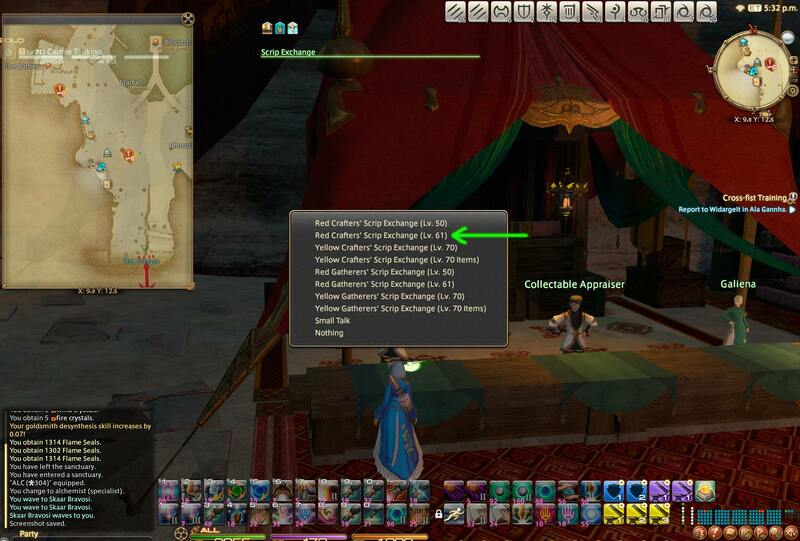 Details about Alderan please visit Caimie's Heavensward Crafting Guide Ch40. At this point, instead of quickly becoming a BSM specialist to make the majority of MHs, it is actually more beneficial to first become an ARM specialist, so that you can make the i325 Alembic for your ALC. Then become WVR/LTW specialists to make the i320 left gear. Alternatively, you can ask a veteran crafter friend to help out in crafting some items, so you don't have to switch around your specialists. If you have a GSM specialist friend, you may also ask her/him to make you the MH for your WVR, which will help out in crafting your i320 head/chest/pants. Once you have geared up your ALC fully, and have your gear/tool melded, STOP USING MAMA ROTATIONS! You will likely have sufficient power to macro your Oils and Fibers using the Initial Prep rotation (together with some HQ mats). This will make your life a lot easier than spending decades doing MaMa rotations on Oils/Fibers. *As of Patch 4.3, the game has introduced i340 gear. Thus, it is not necessary to acquire a whole set of the i320/i325 Ala Mhigan crafting set. You may send the mats to an accomplished crafter to help you make the new Patch 4.3 crafting gear. If you haven't done any overmelds yet, I suggest you doing it on the newest 4.3 gear instead of these Ala Mhigan i320/i325 gear. By popular demand, I have added this chapter here regarding materia melding on the new i320 gear and i325 tools. As mentioned in Ch59, I think a safe amount of craftsmanship would be 1584 (This stats is with the soul gem! Without the gem would be 1564.) (could be lower than this, I'm not sure). This amount will allow the use of my modified Tayler's Initial Prep rotation. If you have this amount of base craftsmanship, you don't have to use HQ Tempura Platter for special 2 star recipes. Instead, you can a Control+CP food, such as HQ Seafood Stew (from Heavensward). This way, you can further boost control to help with quality. For CP, it is a consensus that it should be maxed (or at least near-maxed) on every item. For control, it's just a matter of as much as you can afford. For instance, if you cannot afford as many Command VI as I have used below, then just use Command V instead, but plan your melds, so that anything more expensive than Command V goes onto the gear first. The strategy of materia overmelds has never changed since ancient times in ARR. First, you plan your 5 materias that can max, or nearly max out all 3 types of stats. Beware of the stats caps, and avoid unnecessary expensive materia that provides no extra benefits. 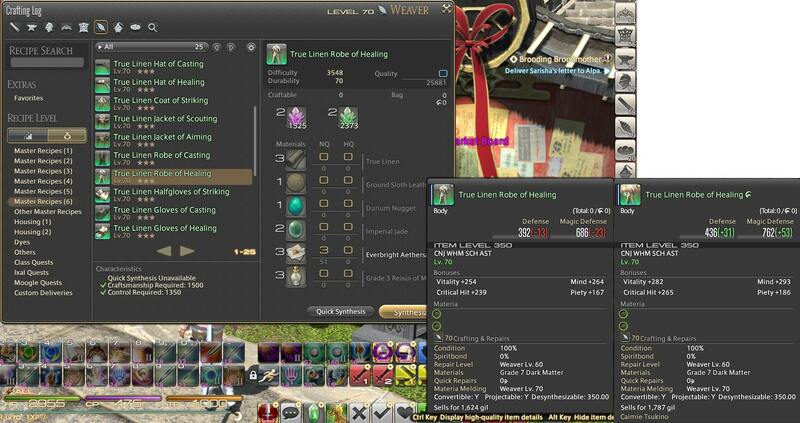 Then, you judge your sequence of melds according to (1) price, (2) amounts of materia you have, and (3) success rate. Price is the most directly relevant to your sequence of melds. Always start off with the most expensive materia, and work your way towards the cheaper ones. Just like old times, the bad strategy would be: "Oh, I can use a bit more CP right now, so lets meld some CP now! ", or "Oh, I got a lot of competence materia. I can afford melding a few right now!" These are terrible ideas. Usually, CP materias are cheaper while command materia (for control) are the most expensive. So even though I said above that maxing CP is more important than maxing control, it would be foolish to start off your melds with CP materia. You want to save up enough slots later down the road so you can max out your CP, but you usually want to start off with command or competence materia (well, unless you found that the current price for CP materia is actually highest, then ok, you start off with CP materia). Again, check the prices of each materia you plan to use, and plan your sequence of melds ahead of the game. FYI, Tier VI materia can only be fitted into the first overmelding slot. That is, if your gear has 2 slots for in-slot melds. You can fit up to a total of 3 Tier VI materias on that gear. Once you reach the 2nd overmeld, the game will automatically deny your use of Tier VI materias. - I have 1589 craftsmanship, but it is not necessary to have this much. 1584 or lower could be fine too. As for CP, you really want to aim as high as possible. NOTE: This is one of my specialist classes, so some stats come from the Soul Crystal. - For my chest piece, there is still 1 slot left. I have not decided to add what stats yet. The chest here still has 1 CP available to be obtained, and much control or craftsmanship to be obtained. For the pants on the right side, it now seems to me that the use of Tier VI competence materia there was not necessary. I could have used a Tier V (+11 craft) instead. I would have 3 craftsmanship less, but it's something that is ok.
- These 3 gear were all done properly. I have no regrets with how they were done. I recommend you all to follow. - The belt and the accessories are both i290 from Patch 4.0. No new belt/acc were introduced in 4.1 yet. - The Earrings, Necklace and Bracelets have the same melding caps. So one could do exactly the same melds on all 3 of them. For me, however, I pushed a tad bit more craftsmanship (5 more) on the Necklace. It is not necessary, but I like it. 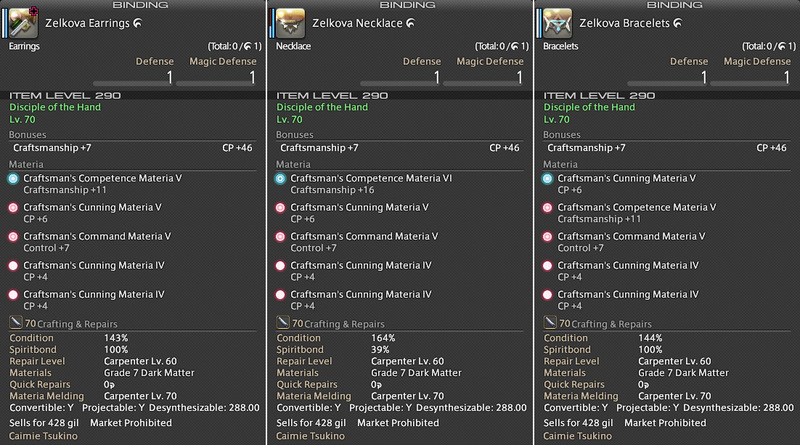 For the Bracelets, I started off with a CP+6 materia there, because at that time, CP+6 was a lot more expensive than Craftsmanship+11. So once again, current prices of materia are the major dictators of melding sequence. - As you see here, I preferred to have 1 ring having more control while the other ring having more craftsmanship. You don't have to follow me. You could put more crafts or more control on both rings. It really depends on what ultimate stats you're shooting for. - I have really been slacking with melding on mainhand and offhand tools. I just don't like the idea of doing bank-breaking melds on all 8 tools for all 8 classes. So I just melded CP materias there. Each of these tools can hold up to 5 CP. I am still missing 1 CP to be melded on the mainhand, but it's not critical. (1) the sequence of materia removal is opposite to that of your sequence of meld, i.e. you start off by removing the ones that were melded last, and gradually work towards the ones that you melded first. (2) Tier I, II, III, IV materias have 100% removal rate. Tier V is at 80% and Tier VI is at 40%. These numbers are unaffected by the position/slot of the materias, i.e. an overmelded materia has the same removal rate as an in-slot melded materia. (3) Materia removal is FREE of charge. (i) We can now "recycle" materia! So after we acquiring a piece of stronger equipment, we can now retrieve all those precious materias from the old gear before converting the gear into a new materia, and then use the retrieved old materia on the new gear. Thus, we now have to keep in mind: AFTER SPIRITBONDING IS COMPLETE, ALWAYS REMOVE ALL MATERIA BEFORE CONVERTING THE GEAR INTO A MATERIA. Similarly, before turning in any equipment to the Grand Company for seals, make sure you retrieve all your materia first! (ii) It allows "temporary melds" on a piece of gear. 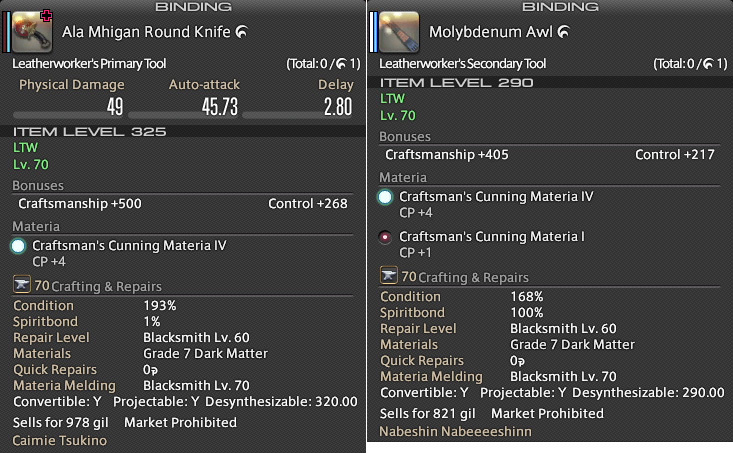 For instance, if one does not have enough gil/materia for penta-melding a new piece of i320, then one can temporarily meld in some cheaper CP materia. OR, meld in a Tier VI materia first, and then temporarily meld in some cheaper CP materia. Later, one can remove the cheap CP materia, and then continue the expensive overmelding process on top of the Tier VI that was already melded there. (iii) It greatly encourages spiritbonding of new gear into materia. 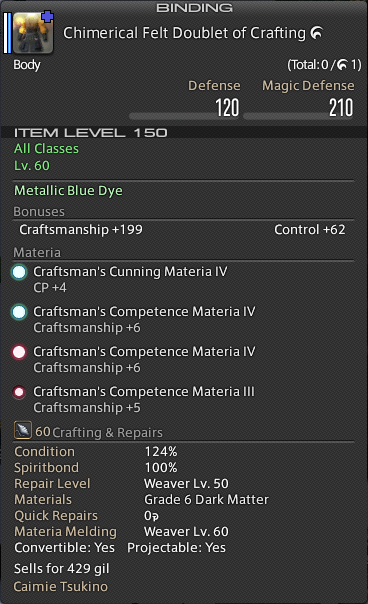 As we can now temporarily meld materia onto our crafting gear (to speed up the spiritbonding process, and to provide the needed stats), and then later retrieve most of those materias before converting the gear. These Custom Deliveries award Yellow Scrips, Red Scrips, EXP and gil. They are the FASTEST and CHEAPEST way to earn Yellow Scrips, and they award a ton of EXP if you have not reached level 70 yet. So one should unlock them as soon as possible and complete them each week. 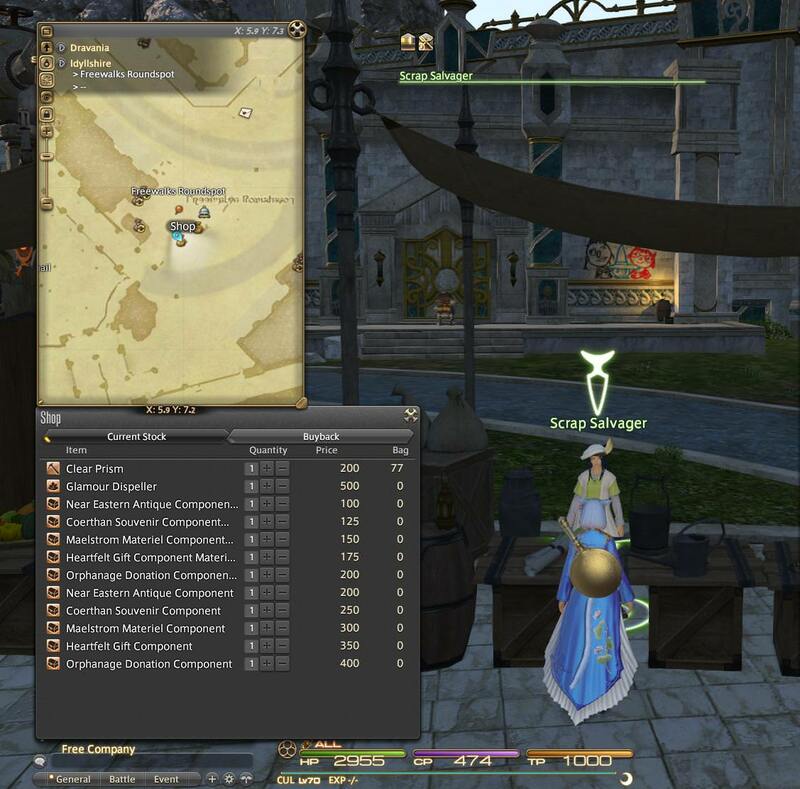 Yellow Scrips are currently mostly used for buying Gyr Abanian Alchemic from the Scrip Exchange NPC at Rhalgr's Reach for i325 tools and i320 gear. 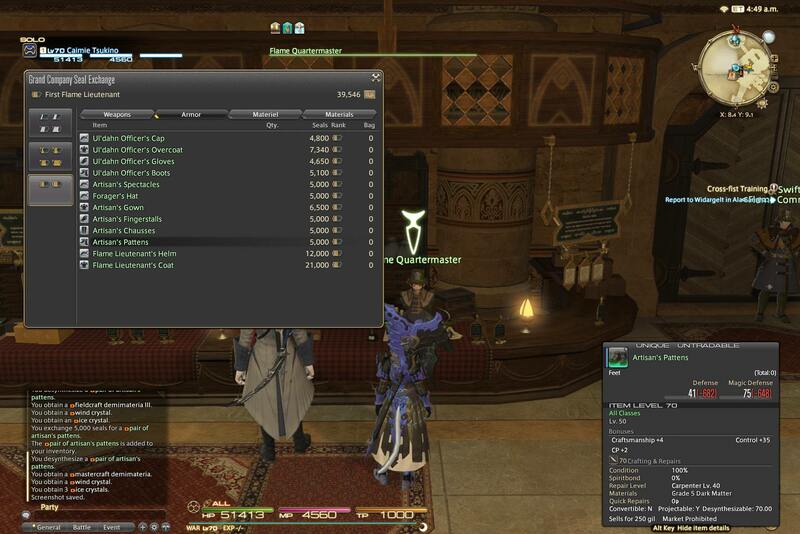 Red Scrips can be used to buy Tier V materia from the Scrip Exchanges at Rhalgr's Reach, Idyllshire or Mor Dhona. 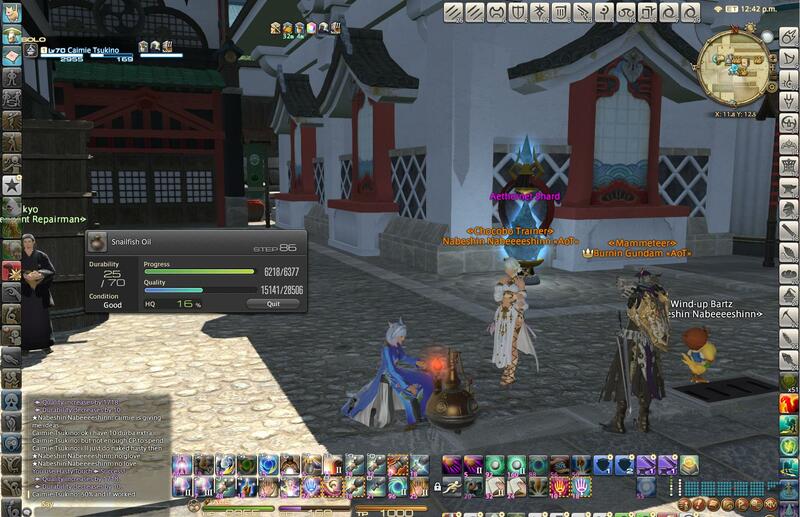 To unlock Zhloe's quests, you must first complete the quest "Go West, Craftsman" at Mor Dhona. To unlock M'naago, you must first speak to Galiena at Rhalgr's Reach (x 9.8, y 12.5). Each week, you're allowed to turn in only up to 6 of the requested collectables to M'naago (and another 6 to Zhloe). So try your best to turn in only the ones with the highest collectability/collectable ratings, so that you can maximize the Red Scrips & Yellow Scrips gain. - BEFORE you max your "5 Hearts" with Zhloe or M'naago, the item of request will be switched every time you "rank up". So DO NOT make more than 3 collectables each time, or you will just end up jamming your inventory with collectables that cannot be submitted! - AFTER you max your "5 Hearts", then no "rank up" will happen anymore. Thus, you can make 6 of the same collectables in a row since Zhloe or M'naago will receive all 6 of them without changing to another item. - To make Collectables for Custom Deliveries, please don't forget to turn on Collectable Synthesis! It's a very common mistake even among the best of us! 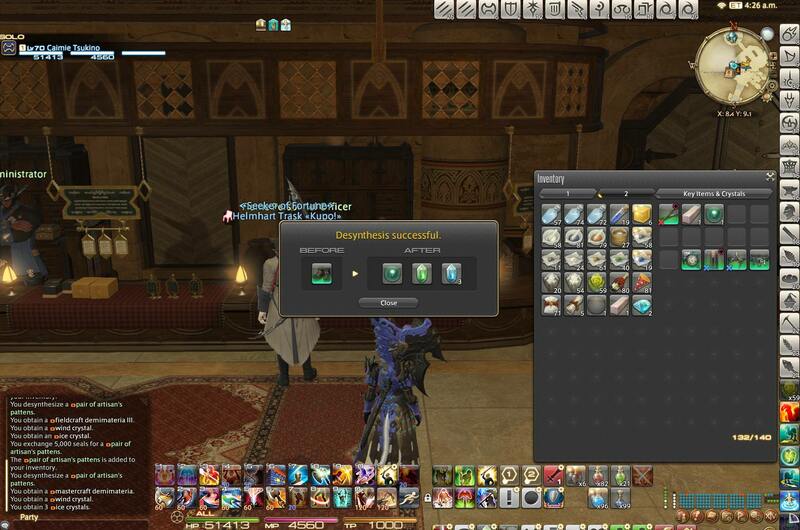 Note that Collectable Synthesis can be turned on even AFTER you started crafting something. So as long as you have not completed the item yet, you can still "rescue" the situation by clicking this button. - Zhloe is located at (x 4.7, y 6.5) at Idyllshire. - The Scrap Salvager at Idyllshire (x 5.9, y 7.3) is where you buy the mats to craft your items for Zhloe's custom delivery quests. Remember to turn on "Collectable Synthesis"! - M'naago is located at Rhalgr's Reach (x 14.4, y 9.5). - The Material Suppler at Rhalgr's Reach (x 9.7, y 11.8) is where you buy the mats to craft your items for M'naago's custom delivery quests. Again, remember to turn on "Collectable Synthesis"! 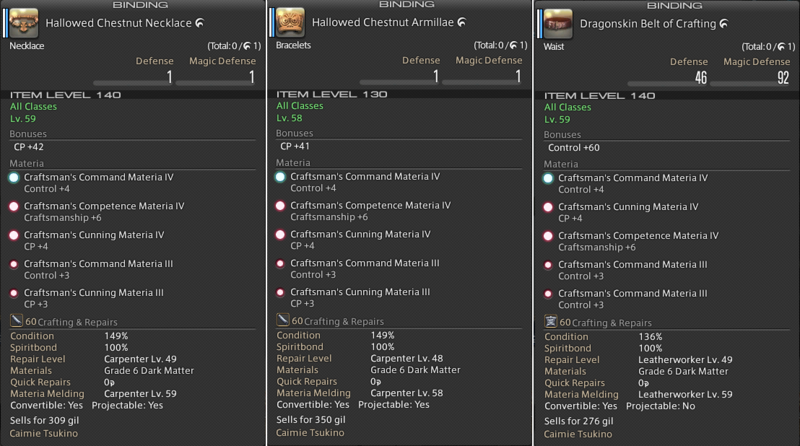 To craft the i325 mainhand tools and the i320 crafting gear in Stormblood, you will need Mastercraft Demimateria and Fieldcraft Demimateria III (FC3) respectively. This created a sudden need for these demimateria on the market. Mastercraft demi's can only be obtained via desynthesis. 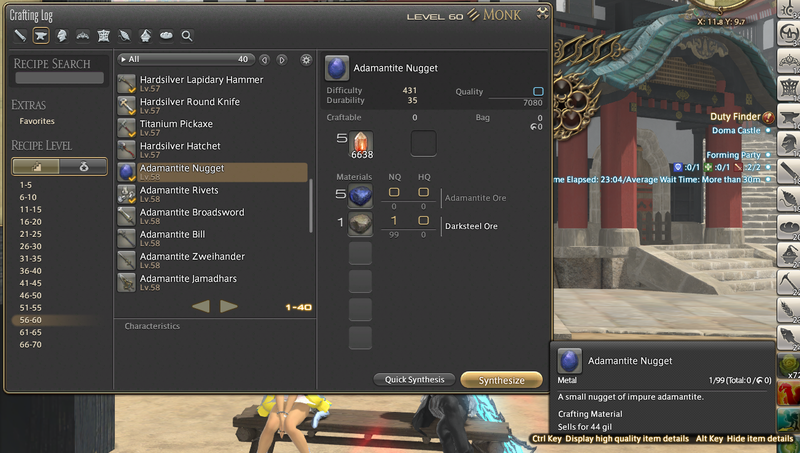 And the cheapest items to obtain them are the i70 Artisan tools and gear. 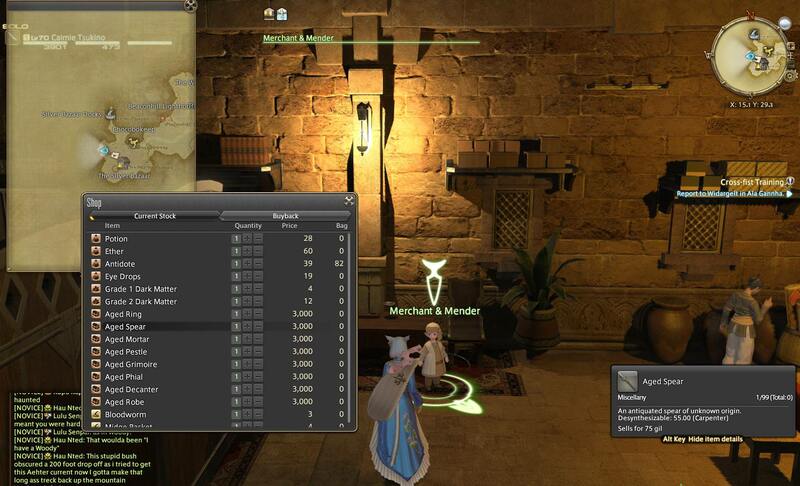 Since Patch 4.15, i70 Artisan Mainhand Tools, Artisan's Spectacles and multiple Artisan Gear can now be purchased directly from Grand Companies using GC seals. Artisan's Specs and Artisan Gear has the potential to drop only 1 Mastercraft per desyn, whereas Artisan Tools can drop between 1 to 3 Mastercrafts each time. The rate of Mastercraft dropping from desyn is between 1/4 to 1/8. It is a consensus now that the tools are a better choice to desyn than the specs and gear due to its potentials to drop 3 Mastercrafts, but ultimately it still depends on luck. Artisan Tools now cost 7,500 GC seals each, and Artisan's Spectacles / Gear cost 5,000 GC seals each (Artisan's Gown cost 6,500 seals). - Artisan Tools are now available from Grand Company for 7,500 GC seals. - Artisan's Spectacles and other Artisan gear are also available for 5,000 seals. But these items can only drop at most 1 Mastercraft per desyn. - Here is the evidence, showing you that even Artisan's Pattens can be desyn by Carpenter into Mastercraft. I got this one after desyning 1x Artisan's Fingerstalls and 5x Artisan's Pattens. So the rate of Mastercraft I got here was 1 out of 6. At least, I took the effort of spending 30,000 seals to prove that it works, and to give you this data! 7,500 GC seals seem like a lot. But if you're running Stormblood dungeons and rolling for gear drops. You can easily earn enough seals. Each Stormblood dungeon gear drop is worth about 1200 to 1300 seals each when you turn them in as "Expert Delivery" to the GC. 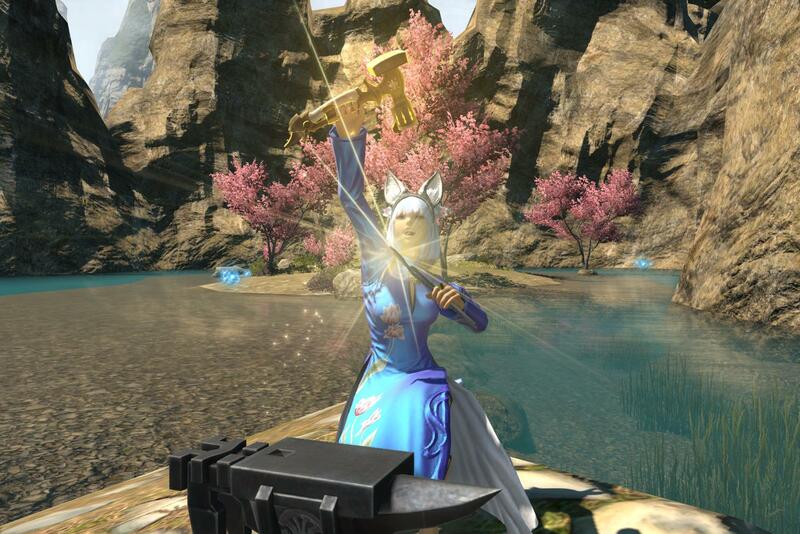 Thus, if you intend to earn seals for the purpose of generating Mastercraft Demi's, you might as well level up your tank classes or healer classes by running Stormblood dungeons and loot for gear. Killing two birds with one stone! Don't forget to do your Trial and Leveling Roulette each day. They also give you a lot of GC seals. Nevertheless, if you find that the 7,500 seals is just too much for you, you can indeed still go back to Talan in Mor Dhona, and obtain your Artisan Tools using the old school ARR method of turn-in's. - The old method of obtaining Mastercraft Demimateria is still valid, done via Talan in Mor Dhona. 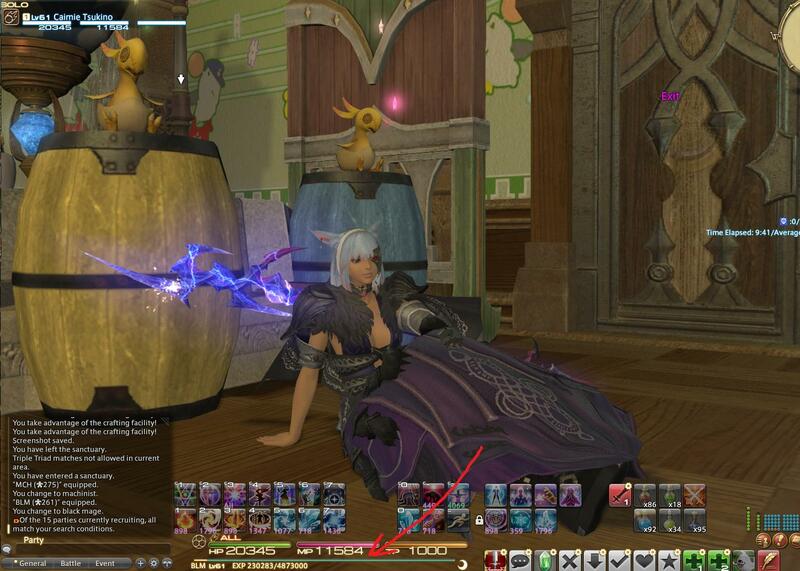 Back in ARR, it required level 100 desynthesis to be able to securely desyn i70 tools. Now they have adjusted it so that the level for desyn is similar to the ilevel of the item which you can desyn. Thus, you only need about level 70 now to desyn the i70 Artisan Tools. As for the generation of FC3s, they can be obtained by desyning the Artisan Tools as well, but the cheapest way is still by desyning Bridesmaid's Sandals purchased with gil from Rianne in Uldah (below is a picture from my old crafting guide Part 2). - By the way, someone asked me how one could get the inventory to look like this. The way to do it is: Character Configuration -> Item Settings -> Character -> Inventory Settings -> Inventory Interface / Retainer Inventory Interface -> choose "Expanded". Enjoy! I heard a lot of people had their desynthesis trained up to around level 150 to 160-ish back in Heavensward, and then faced some problems with further training in Stormblood. This is because regular level 59 recipes from Heavensward only goes up to ilevel 145. i150 items in Master recipes 3 can be utilized. But after that, i160, i170 and i180 gear (HW 2 star recipes) are very expensive to make. The lowest level 61 recipe in Stormblood is already i255 gear. Thus, there is a huge gap of about 100 levels in the middle, without easy items for leveling desynthesis. At this point (Patch 4.18), we really don't know if desynthesis has any important use in future Stormblood patches apart from just generating FC3, BC3 and Mastercraft demi's. If you only need Mastercrafts, then there's really no point in leveling desyn beyond level 70. If you don't even have level 70 desyn yet, you can make use of the vendor items from Silver Bazaar to complete your beginner's training of desyn (see pic below). 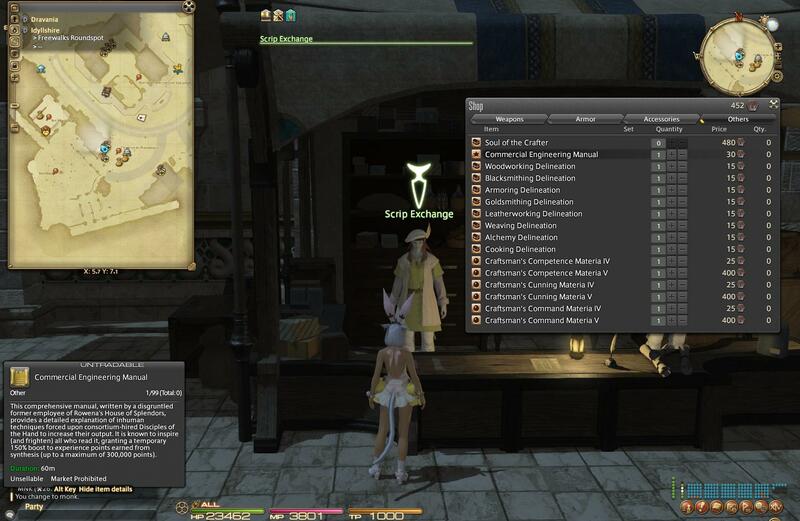 - This vendor at the Silver Bazaar sells i55 items which can be used for training desynthesis. First, of course try to push as hard as you can with i145 (level 59-60 recipes in your regular crafting log) and i150 (in Master Recipes 3) items. Then, as you can see in the pic below, you can buy Kingcake (CUL), Adamantite Francesca (BSM), Titanium Alloy Mirror (ALC) and Dispelling Arrow (CRP) for 5K seals each from Grand Companies to train desynthesis. These items are equivalent to i160 gear. - Kingcake (CUL), Titanium Alloy Mirror (ALC), Adamantite Francesca (BSM) and Dispelling Arrow (CRP) can be purchased with GC seals for training desynthesis. For classes that don't have such items from the GC, like GSM, you can easily farm for loots just by doing light farming for your anima weapon. Alexander 1 Savage (the one with the two Oppressors) is extremely easy to farm. And people don't bother to get the loots. You can grab them all, and they're i190 accessories, which are extremely good for bridging the gap. Thoroughly search through your Housing Recipes and Master Recipes, and see if you can cheaply make some suitable furniture that is within budget for desyn training (Master Recipes contain housing items too!). Master Recipes sometimes also contain glamor gear that may not be too expensive to make. Make sure you go through every single item on these recipes to find anything that you can utilize. The i220 Eikon gear set (HW 3 star recipes) in Master Recipes (4) is actually not so bad. They are still expensive, but are more affordable than the i160/i170/i180 in Master Recipes (3). You just need to meld more materia on them, and pop a Tinker's Calm and/or Bacon Broth. After that, i250 (HW 4 star recipes) in Master Recipes (4) can be utilized even though they're quite expensive. In addition to crafted items, Poetics tomes-exchanged gear (i230) from Idyllshire are also great for training desyn. You can purchase them cheaply from Hismena. Items for LTW, ARM, WVR and GSM are all easily available there. Just be a smart person, and AVOID the chest piece and pants if you can since they're more expensive (If you're WVR, just go for the caster or healer hat or equivalents). AVOID the belts as well, since they have only 1 slot for materia (If you're LTW, just go for the boots). As for BSM, CRP and ALC, they can still use this method. But they need to buy weapons. So they can first buy 10x Rowena's Token (Lore) and 1x High-Capacicity Tomestone from Hismena, and then exchange for weapons from Bertana. The total cost of each weapon will be 500 poetics... basically a bit more than double of that for LTW, ARM, WVR and GSM. - Eikon gear of i230 can be easily purchased with Poetics tomes for desyn of LTW, WVR, ARM and GSM. Avoid the chest piece and pants if you can since they're more expensive. - For BSM, CRP and ALC, one can purchase weapons instead. So buy Rowena's Token (Lore) and High-capacity Tomestone from Hismena (1st pic above), and then exchange for the weapons from Bertana (2nd pic above). There were rumors about how 100% spiritbonded or HQ gear having higher chance of desynthesis success rate. To hell with them! None of them were true! Desyn success rate has absolutely nothing to do with spiritbonding or gear quality. What actually matters is just the melding of materia on a gear! 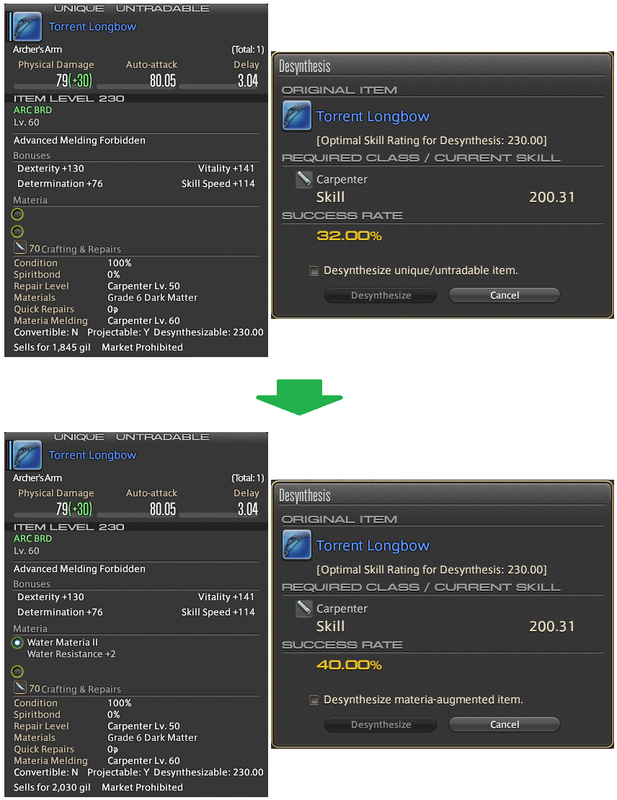 Each materia meld increases desyn success rate of an item by 8% (used to be only 5% back in ARR). 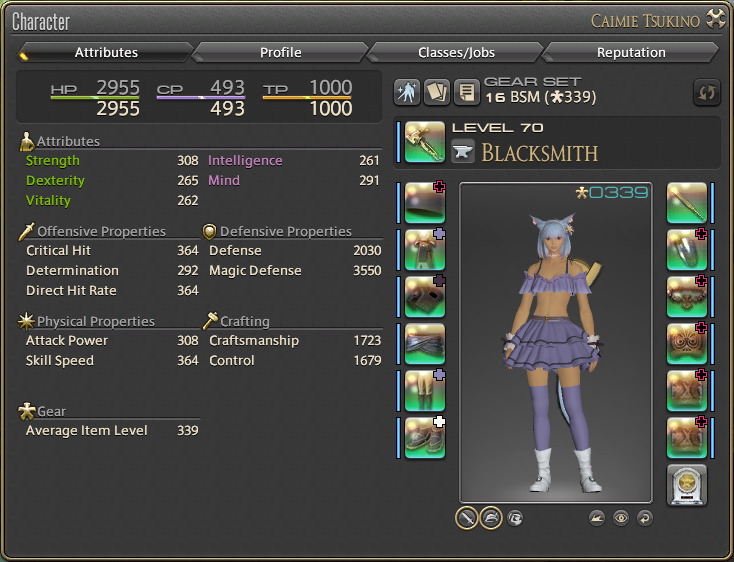 HQ gear does have a slightly higher rate for successful materia OVERMELD though. So if you plan to craft some very expensive items for desyn (and was planning to heavily overmeld them), then you may consider making the gear HQ just to assist the overmelding process. 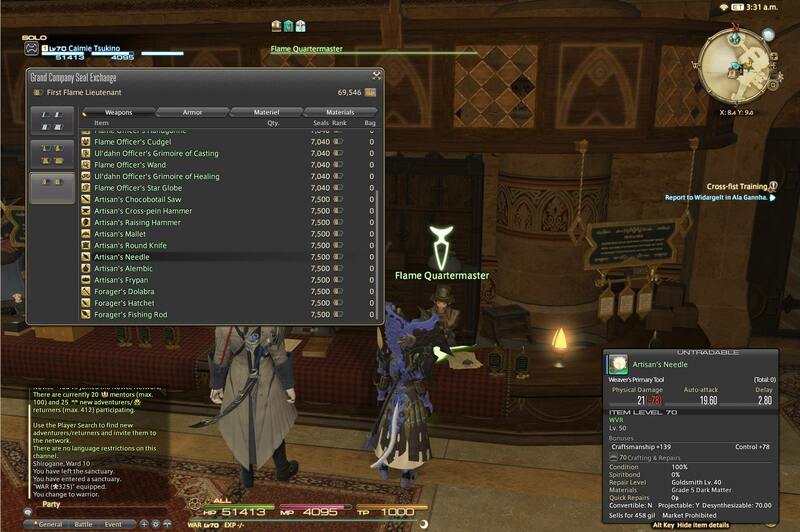 - Back in ARR, each materia meld increased desyn success rate by 5%. Now in Stormblood, each meld increases desyn rate by 8%. Please be aware that only crafted gear can be used for overmelding. Tome-exchanged gear can only perform in-slot melds. And since Tier I materia has the highest overmeld rate, it becomes extremely popular on the market for the purpose of desyn training. This is also the reason why elemental Tier I materia are actually useful. 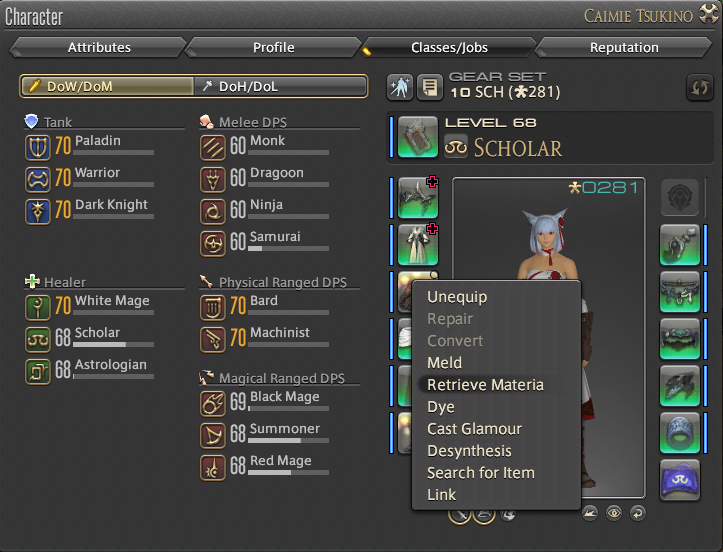 As to other types of Tier I materia, like Dexterity or Mind Materia I, they can only be used for in-slot melds, but CANNOT be used for overmelds. This is because "Primary Stats" cannot be overmelded. Only "Secondary Stats", like crit, determination or elemental resistance etc. can be overmelded. Thus, you can still use Dexterity Materia I to help with desyn by putting them into slots (you can even use Tier II or Tier III since it's in-slot anyway!). But if you intend to overmeld, then you will need elemental or secondary stats materia. If Tier I of them are not cheaply available on the market, you can consider using Tier II. - A chart I made back in ARR to demonstrate the success rate of each overmeld for different tiers of materia. Some food and medicine provides the effect of "Careful Desynthesis". Back in ARR, Careful Desyn +1 will add only 2.5% desyn rate. Now in Stormblood, Careful Desyn +1 will add 4% desyn rate. Bacon Broth is a food that can slightly increase desynthesis success rate, which can be useful if you plan to desyn large amounts of expensive gear. This food is an ARR 4 star item in Master Recipes 2. HQ broth adds 8% success rate to desynthesis (Careful Desynthesis +2). NQ broth adds 4% (Careful Desynthesis +1). Tinker's Calm (see below) is NOT a food, but a potion that can increase desyn rate a lot more. NQ ones can increase success rate by 12% (Careful Desynthesis +3). HQ ones can increase success rate by 16% (Careful Desynthesis +4). However, because Tinker's Calm is not a food, its effect only lasts 10 min (used to be only 5 min back in ARR). NOTE: Since Tinker's Calm is NOT a food, you can actually use BOTH Bacon Broth and Tinker's Calm simultaneously to increase desynthesis success rate! If you use HQ broth + HQ calm, you can increase desyn success rate by up to 8%+16% = 24%!!! - HQ Tinker's Calm (+4 Careful Desynthesis) adds 16% success rate to desyn (used to be only 10% back in ARR). However, the effect of the medicine only lasts for a very short 10 minutes. In Patch 4.2, Master Recipe Books VI has been introduced, which contains 3 star recipes (both 35 and 70 durab). The books are purchased from the Scrip Exchange NPC at Rhalgr's Reach for 1200 Red Scrips each. 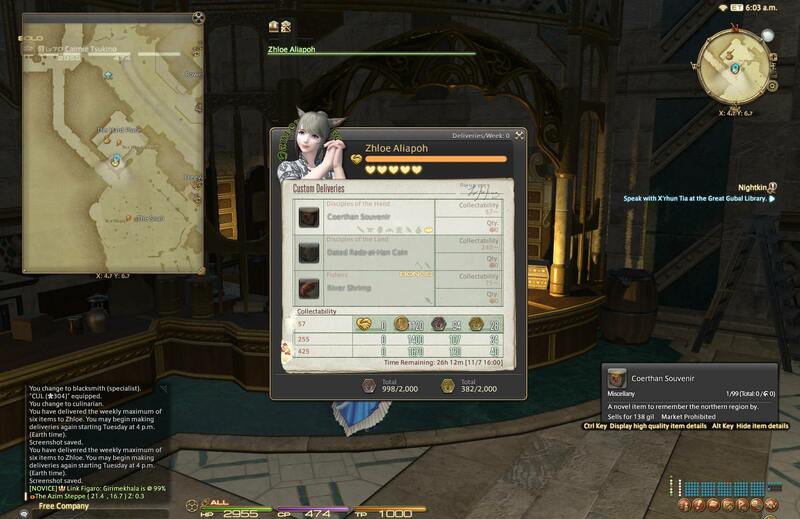 i330 augmented class-specific scrip-exchanged gear has also been introduced. They require an i300 gear to be upgraded using Red Scrips. 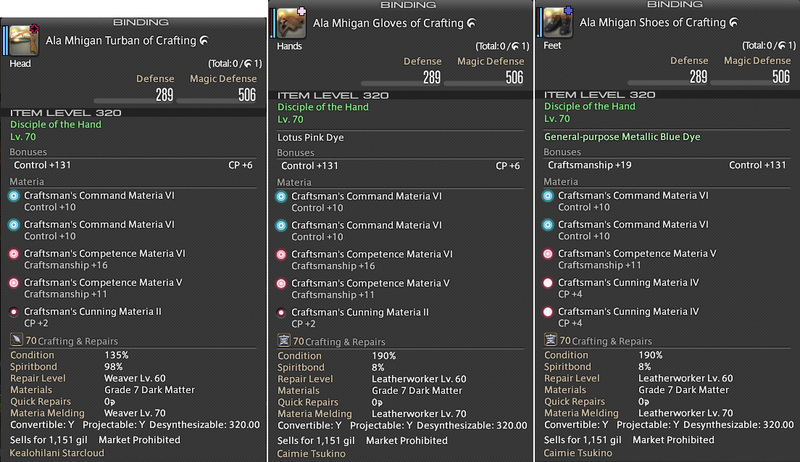 If you already have the i320 Ala Mhigan crafting gear set and i325 tools, there's no point in acquiring any i330 gear. ALL 3 stats of the i330 are inferior to a well-melded i320 (which came as a surprise, since I would have expected at least 1 type of stats would be superior in the i330. But nope... in the end all 3 stats are lower than a strongly-melded i320). 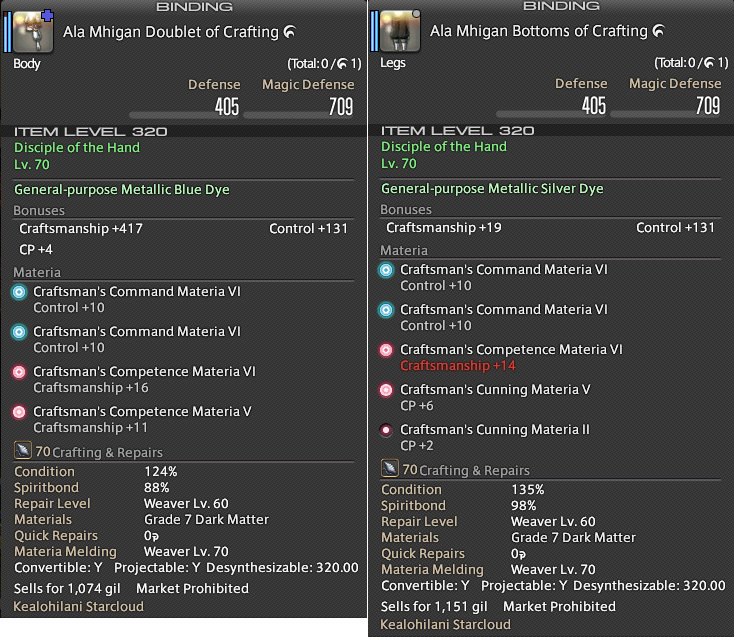 Also, the crafted Ala Mhigan i320 gear set is shared, so that just makes them so much more desirable than i330. The new Master Book VI contains i350 battle gear (shown below) as well as cool minions like the Byakko Cub minion. The new gear do sell quite well on the first two days of the patch, but now the market is pretty saturated, and it's all that undercutting war happening right now. 3548 Difficulty, 25881 Quality, 70 Durability. Minimal requirement by the game: 1500 craftsmanship, 1350 control. These recipes are relatively easy since you can use exactly the same rotation as the special 2 star recipes (i.e. Snailfish Oil rotation in Chapter 60). There's really not much to discuss about this. You can even macro them if you wish. Just be careful that if you're using any Specialist crafting actions, make sure you have the Soul of the Crafter crystal equipped. Personally, I'll just manual craft these final products, so I don't need the Soul Crystal at all. Katlyna (Katrisa Ashe from Ultros) has written a very powerful macro for making 3 star 70 durab items on a Non-Specialist class. It involved some RNG, but it has the potential to HQ the items from pure NQ mats. I don't use it for things like gear or weapons. But I found it particularly useful for making food on my CUL. Most people don't have CUL as their specialist class, so it's usually a tad bit weaker on stats, and has no access to specialist skills. With Katlyna's macro, I can now just use pure NQ mats for making HQ food, which is much easier to obtain. 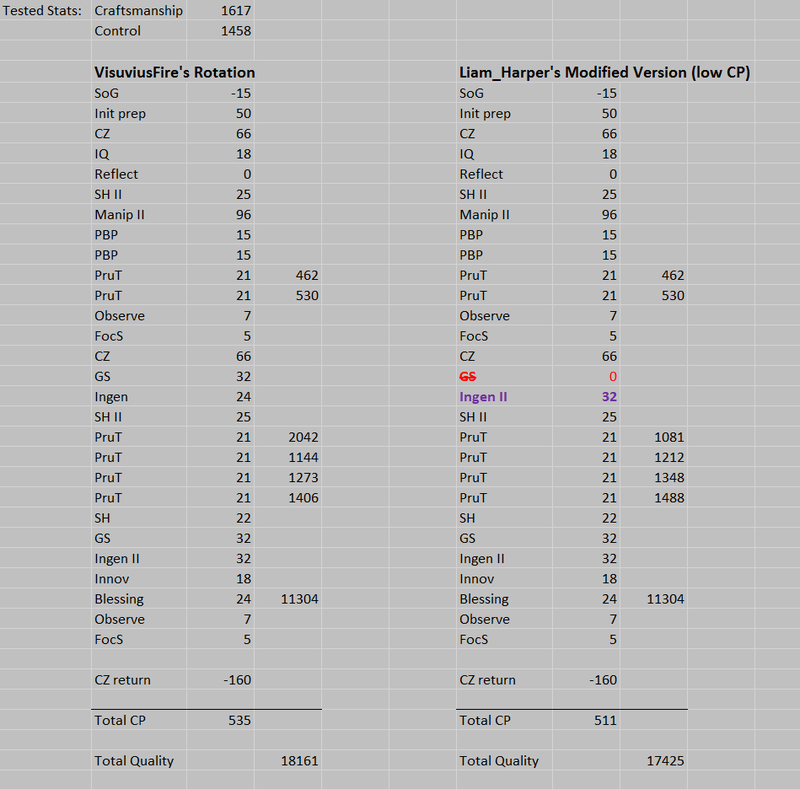 The macro also need only 516 CP, which is extremely low. It's FAST. It's EASY. It's STRONG. It's a little bit risky, but it's great if you're massively producing stuff! 2365 Difficulty, 20335 Quality, 35 Durability. For those with minimal stats trying to manual-craft the new 35 durab items, the key to 35 durab items has always been the same as before - using Manip/Manip2 to "float" your durab up and down. Now that we are in Stormblood, Manip2 completely replaced WN, WN2 and Manip. So all we need is just Manip2. The difference between Manip2 and Manip is that Manip2 replenishes durab a bit slower, with only 5 durab increase per step. But because we now use a lot of Prudent Touches which saves 5 durab per touch, it balances out in the end. An important key concept which we have been upholding since ARR old times is that we must avoid activating Manip (or Manip2 now in SB) when durab is at minimum or maximum. This is because Manip/Manip2 restores durability AFTER it is consumed by your current step. For instance, if you have Manip2 active, and you've been using Hasty Touches to consume durab, your durab will drop by 5 each step (-10 from Hasty, +5 from Manip2). But at 10 durab, if you try to perform another Hasty Touch, you won't have 5 durab remain. Instead, you'll botch. Because the item would break when the Hasty consumes the remaining 10 durab. Manip2 won't have a chance to restore 5 durab afterwards. As to why not to use Manip2 at max durab, this is to avoid overshooting the maximum and wasting durability. Sometimes we need to use Trick of Trade, Steady Hand II or Comfort Zone while Manip2 is active. So, if durab is already at max, then you will just lose the durab that were being restored. - For manual crafting, I start off with MaMa, CZ, IQ. Take any Trick of Trades along the way. Then SH II, PBP, PBP. If good pops, you can consider taking a Trick or spend it on a Patient Touch first. But the key is to reduce durab down to 15, then pop Manip2. - Now we are "floating". Use a Patient Touch if you haven't yet (durab down to 5, then float back to 10), then spam Flawless Syn until durab has floated back to around 25. Before durab hits max, use a CS II or CS III (If you have high craftsmanship, CS II is probably good enough). - At this point, you should have around 1 to 2 steps of Manip2 left, renew your CZ, keep spamming Flawless until Manip2 all finishes. - Now keep spamming Flawless until all MaMa steps are finished, while taking as many Tricks as you can along the way. Refresh CZ when it falls off. After this, your durab should hit max (or near max), CZ is active with plenty of steps to restore CP, IQ should be 3. - With everything looking perfect, you start pushing quality... so go SH II, spam Prudent Touch a bit. When durab is around 20 or 25, start popping Manip2. Total prudent is about 4 in this phase. Now, you can start off a second round of quality-pushing phase with SH II + Ingen1 (depends on ur CP) + prudent spam. IQ should reach 11 stacks before the final finisher phase, and you may still have 1 or 2 extra touches after reaching IQ11. - Finally we are at the finisher phase. Finish up with SH, GS, Ingen2 (or ingen1 if you're out of CP), Innov (optional), Byregot's Blessing. GS + Ingen1 or Ingen2 is necessary for this, as we all know. You can't skip GS, and you must have either Ingen1 or 2 for the Blessing. - Then just finish off with a single CS II or CS III under the remaining steps of Ingen1/2. - Remember to save up 128 CP for the final finisher phase if you can. Otherwise, 120 CP is ok too (using Ingen1 instead of 2), If you still lack CP, have at least 102 (so omit the Innov). If you find that you have plenty of durab but lacking CP, you can also use some Hasty Touch or Hasty Touch II as well. It's a bit riskier, but you can burn durab while conserving CP. - I prefer to take Trick of Trades in the middle of my rotation rather than Precise Touch. I found Precise Touch not as good here, because each time you pop precise touch, you lose your chance to actually have an extra touch. We can't forget that Prudent (21 CP) uses only 5 durab, where as Precise Touch (18 CP) uses 10 durab. By using Precise Touch, although you seem to have saved 3 CP, your durab actually drops VERY fast. So, try to stick to Prudent as much as you can. For macros, I have taken a rotation (for specialists) from Reddit done by VisuviusFire, and modified it into a 3 part macro to avoid the Byregot's Blessing falling onto a Poor. I found it to work like a charm for Specialist classes. The only issue is that it needs a lot of CP... it needs a base amount of about 472 CP, with a final amount of 535 CP after food and medicine. It's very demanding, and requires some expensive food+medicine. If you get an Excellent after the 2nd macro is finished, you can manually hit Byregot immediately, then Observe and Focused Syn to finish it. You need to be specialist to have that extra 15 CP from Stroke of Genius to use the above rotation, as well as having that "Reflect" too. 535 CP is already the amount taken into account stroke of genius being active. If you don't have stroke of genius, it would have been 550 CP. For those with limited CP, Liam Harper has modified VisuviusFire's Rotation into a low CP version, and it works fine too. It delivers slightly less quality, but can be performed with as few as 511 CP. The above non-specialist macro is good that it involves zero RNG, but it's not quite strong enough if you are crafting from pure NQ mats. Katlyna (Katrisa Ashe from Ultros) has written, imo, the best non-specialist macro so far. It involves some RNG, but it's so much stronger. So it's extremely useful for massively making intermediate crafted mats from pure NQ mats. The fact that it only requires 516 CP is a huge bonus too. So we need not consume any expensive food/medicine. You can likely just use a NQ Tempura Platter for it. As of Patch 4.3, the game has introduced shared i340 gear/accessories, i345 mainhand tools and i325 offhand tools. Both of these recipes are under ALC's Master Recipe Book VI. There are many, many ways to craft these Hawk's Eye Sand / Veteran Tree Sap. But what we know is that: There's absolutely no need to use Maker's Mark (MaMa) for them. The difficulty of these recipes are so low that you should not be using MaMa regardless of whether you're manual crafting or macro crafting them. I'm going to list out many great rotations below. You can pick one that suits your own stats. Since you will be making a lot of these items, I recommend keeping ALC as specialist. - This is probably the rotation that requires the least stats, needing only 1500 craft and 503 CP, and able to produce over 20K quality with only 1350 control. However, it is a very risky rotation using two Patient Touches. If any of the Patient Touches fail, the quality will be reduced by a lot. If the 1st Patient Touch fails, you will reach only IQ3 instead of IQ5 after the 2nd Patient Touch. If the 2nd Patient Touch fails, it'll push back your IQ3 stack back to IQ2. If both Patient Touches fail, you will end up with IQ1 instead of IQ5. - This has very low stats requirement as well. But utilizing Specialist's skills, this rotation is much more secure, with all steps being 100%. - This has higher stats requirement. But it gives even better results. As of Patch 4.4, the game has introduced crafted i380 battle gear/accessories. 4 star recipes have been quite a disappointment, as they're just as easy as 3 star recipes. There isn't much changes to rotations, and most 3 star macros can just be directly carried over. I haven't even finished melding my i340 gear, and I can still easily macro these items. VisuviusFire's specialist rotation listed in the previous chapter seems to do just fine for the new 4 star 35 durab items. I have modified Liam Harper's rotation to macro-craft these recipes.